Things are a little crazy around here. The air conditioning ducts are being installed around the house and we are frantically trying to keep going on the Master Bedroom closets. I am trying to decide if I can squeeze an Ikea trip in this week. Meanwhile I am still working on planting some of my finds from this year’s Scott Arboretum Plant Exchange. 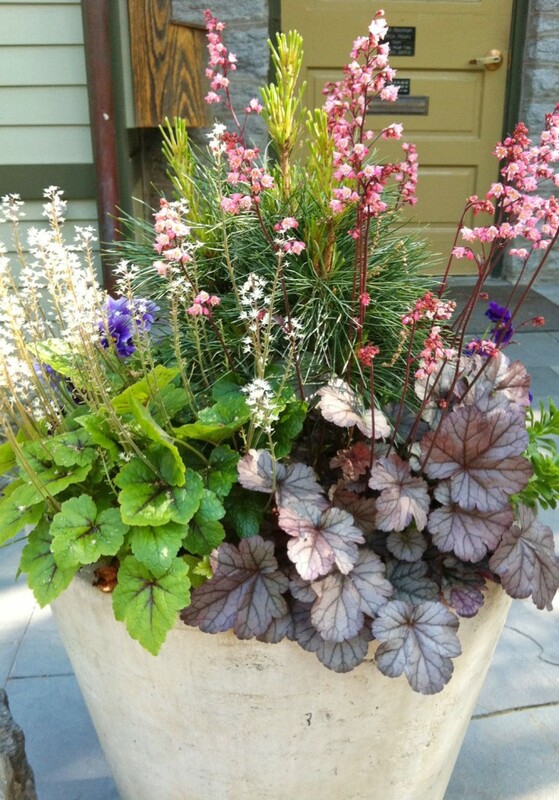 So while the chaos continues I thought I would show you some of the beautiful container plantings that I have been admiring. 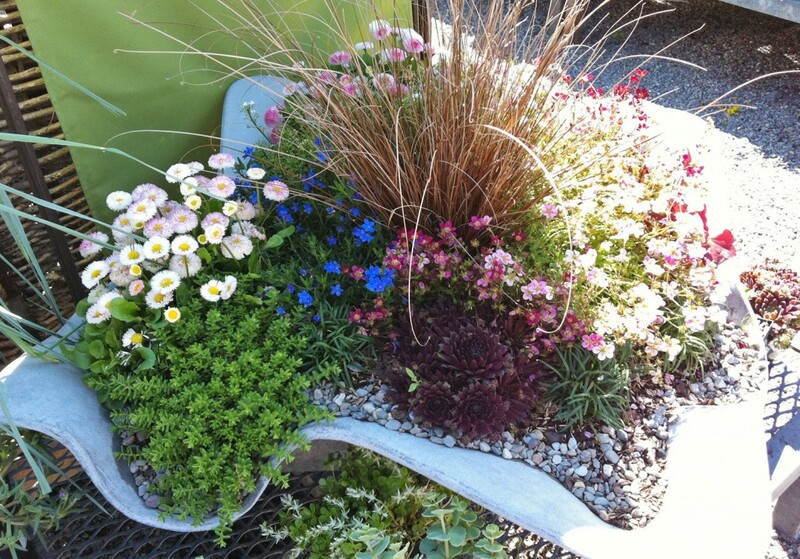 Because who can’t use a little gardening eye candy! On Mother’s Day we managed to make a quick trip over to Terrain (which was filled with well dressed mothers who were busy dining and shopping inside). Of course I was outside, checking out the plants. I did pick up a couple of interesting perennials but my favorite thing about visiting Terrain are their interesting plant combinations. 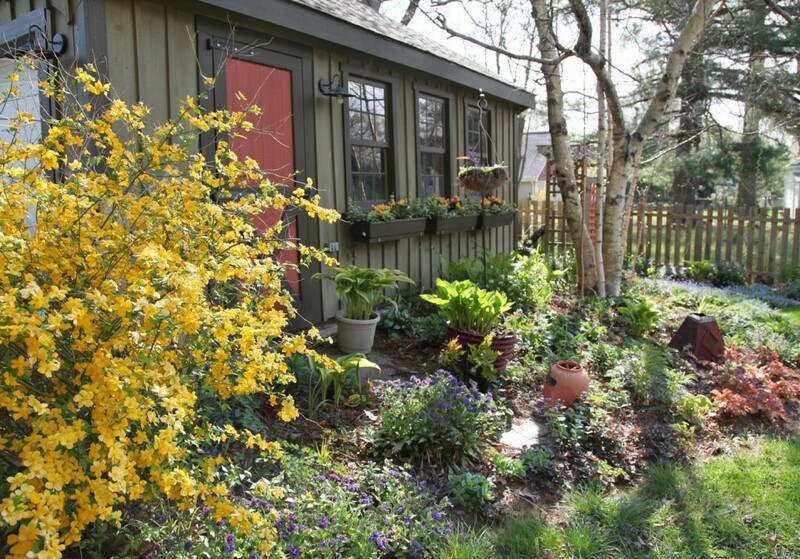 I like the mix of perennials, annuals and even small shrubs and vegetables. This mix helps to keep the cost down and actually extends the season. In this amazing undulating planter above they have mixed a small grass with succulents, ground cover and a few annuals. 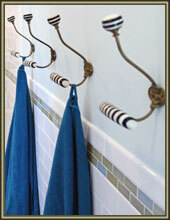 I also like the addition of the small pebbles. The show stopper were a pair of GIANT logs. This picture really isn’t doing it justice, but the carved out logs were stunning (and about 6′ long). I would imagine you would need a backhoe to get it into place, but it was really unexpected. 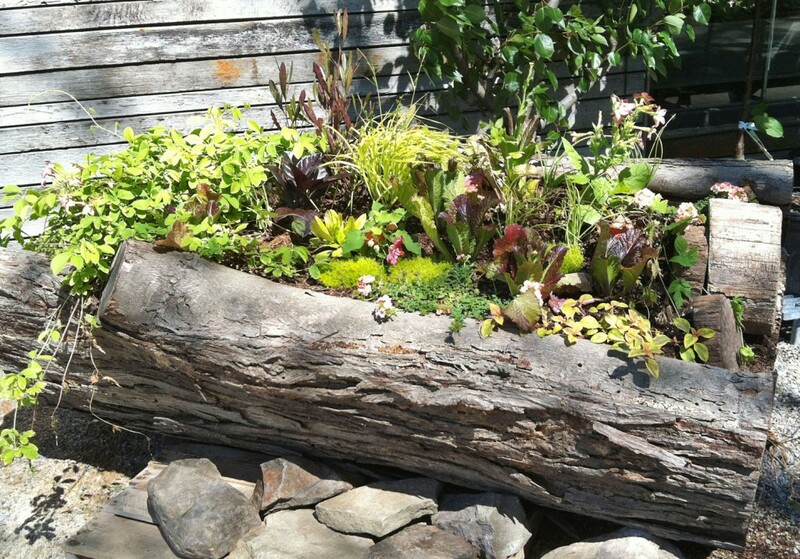 Here they have actually planted some colorful lettuce w/ moss, ground cover and a few flowers. I’m not sure over the long term whether all of these plants would do well in the same amount of sunlight, but it was pretty cool. After our little excursion we stopped over at Scott Arboretum to say ‘hi’ to the fish and so I could admire some of their amazing grounds. In the front of their building they have quite a few containers in part shade. 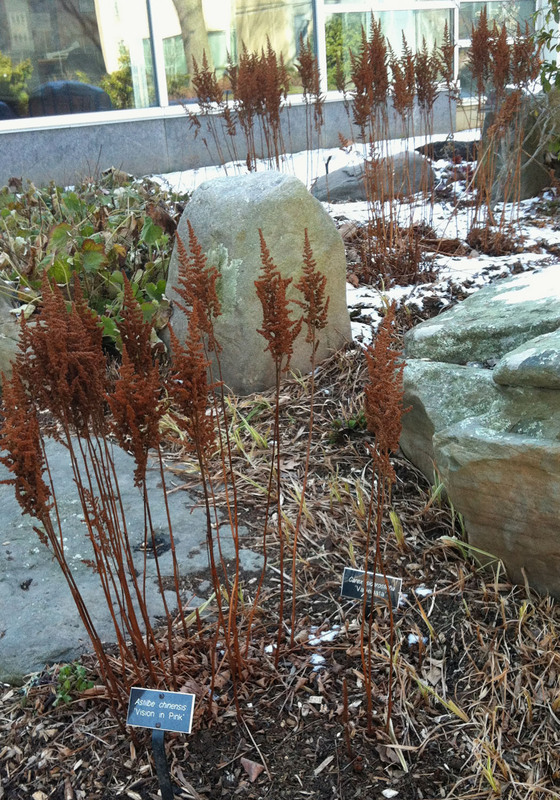 They have used a lot of perennials and they have done a beautiful job of picking ones with amazing texture and color. 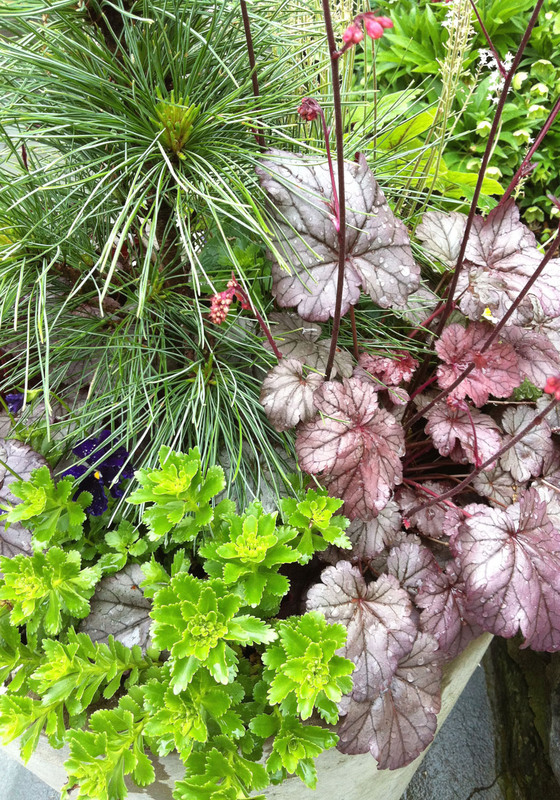 Above this coral bell (heuchera) had a silvery purple leaf. It was paired with a succulent and a small pine. Another similar planter with more heuchera and a couple of blue pansy thrown in for added color. This really makes me want to rethink some of my containers. Granted, both of these places have the advantage of greenhouses and staff to replace plants on a whim, but I will keep plugging away here. 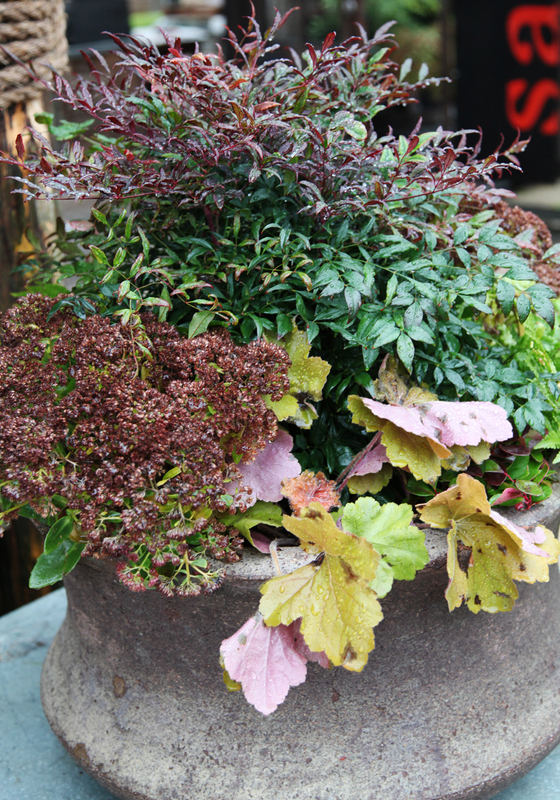 I like the idea of using small shrubs for a season and then putting them in the ground in the fall. 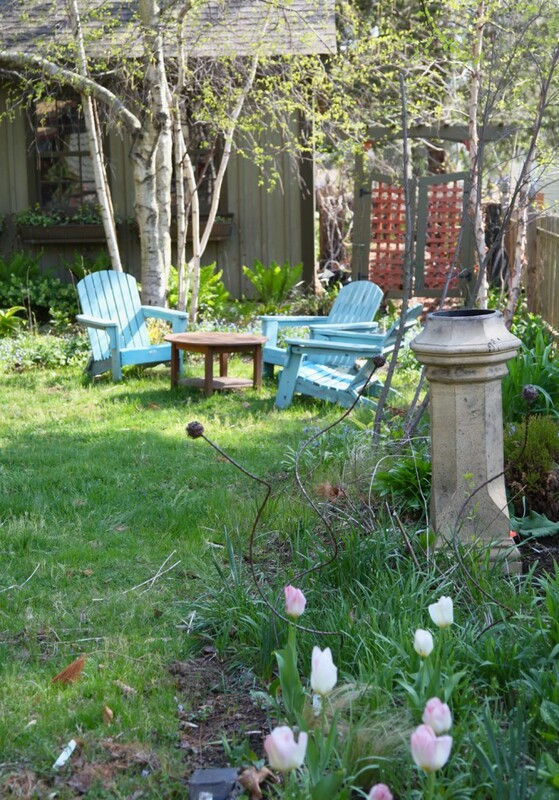 The garden is in peak spring lushness here. I shot these photos earlier this week. Since then we have had a nice rain and everything is even greener! Almost all of the plants are out but the leaves haven’t had a chance to be eaten by bugs (or bunnies) or scorched by the summer sun. 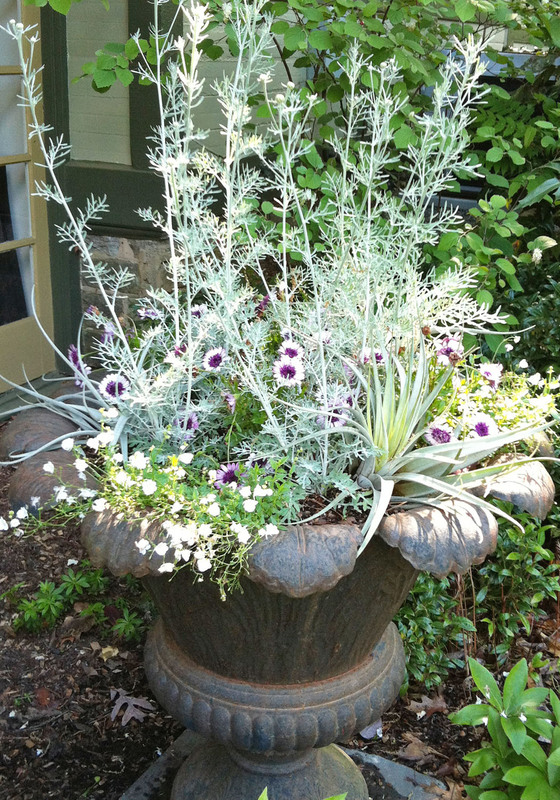 I thought I would highlight a few of my favorite pairings and plants for offering texture. Above is a partial sun area of the garden. 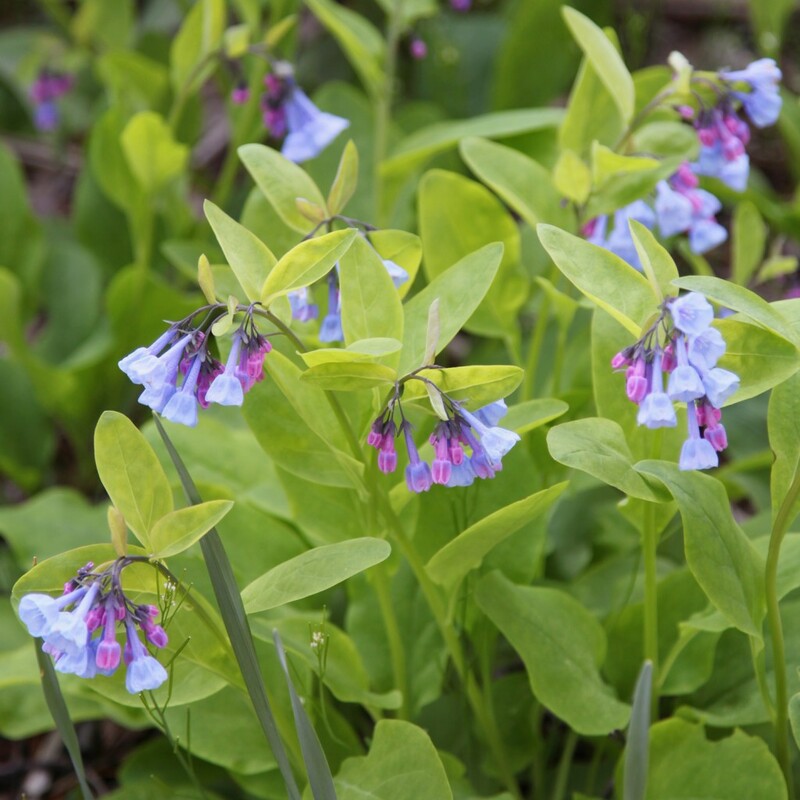 The Virginia Bluebells are still looking lovely, which I like for their nodding blue flowers, but also for their nice oval leaves. 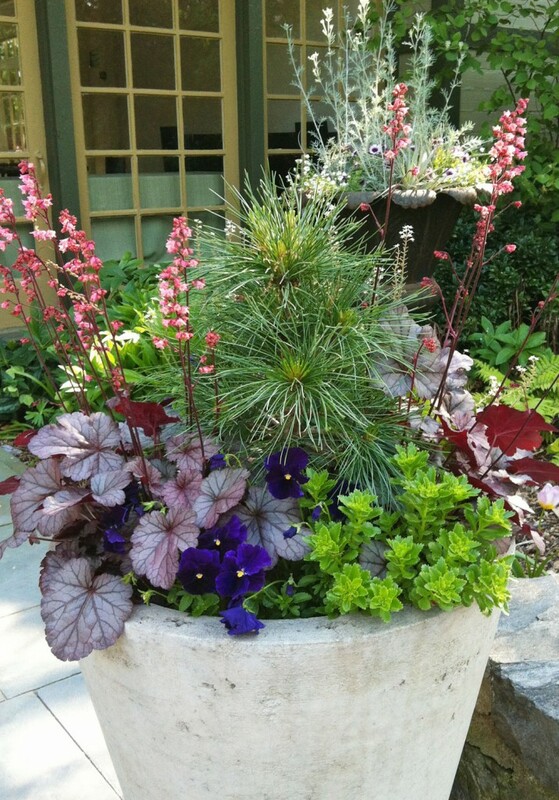 Here they are paired with a Rheingold Globe Arborvitae and hosta. I bought the Rheingold on clearance at Home Depot a couple of years ago. I had another one which didn’t make it, but if I find these again for a good price I will definitely pick a couple up. The color and texture are really nice and they only get to be about 30″. So far it has also kept its “globe” shape really well. This image is in my partial shade garden back by the garage. I really like how the Golden Spiderwort ‘Sweet Kate’ brightens up the bed. It tends to die back in the hot weather, but for now I am really enjoying it. 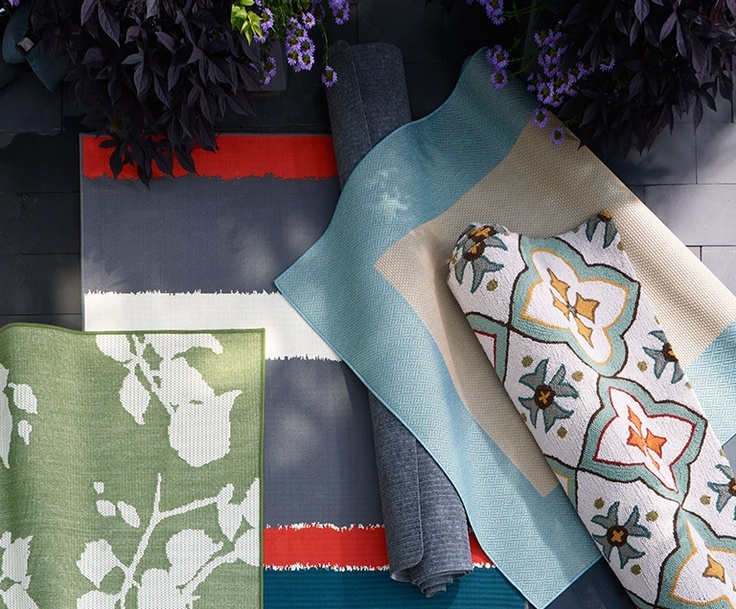 It is paired with a Japanese painted fern, forget-me-knots, geraniums. 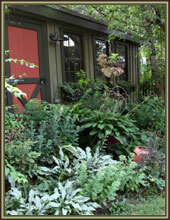 Another spot in the same garden with more painted Japanese ferns, bleeding heart and caramel heuchera. 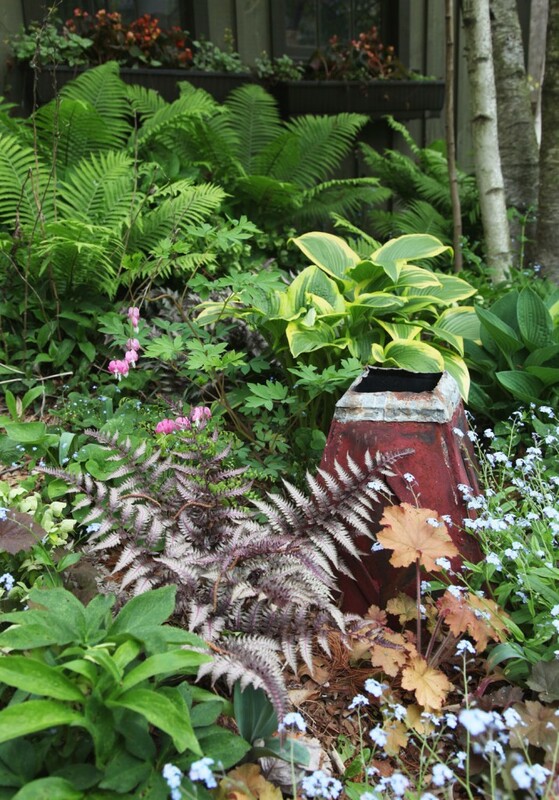 In the back are the lovely tall ostrich ferns, hosta and toad lilies. 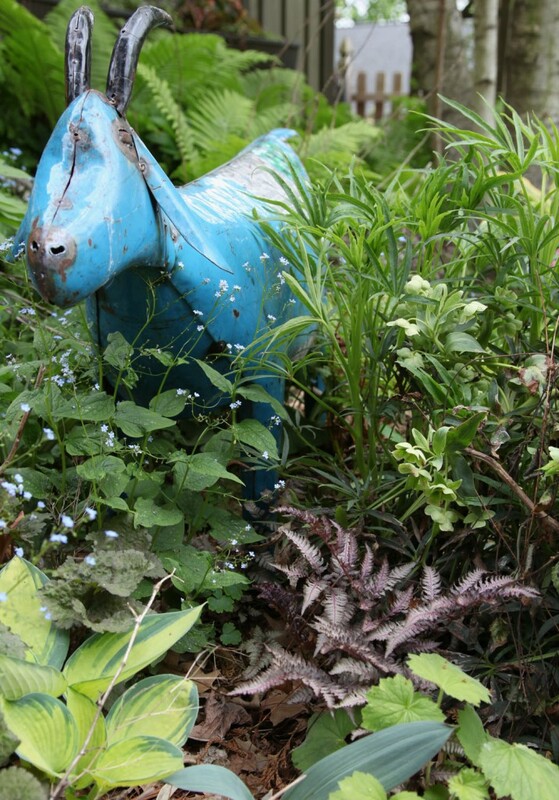 Our garden mascot, the blue goat along with some brunnera. You can see that the painted Japanese fern makes are reoccurring appearance in this bed. I picked up this Peony (Paeonia Japonica) a couple of years ago at a plant sale. It prefers shade and is doing quite well in my shady side yard. The red stems are quite lovely with the large delicate flower. 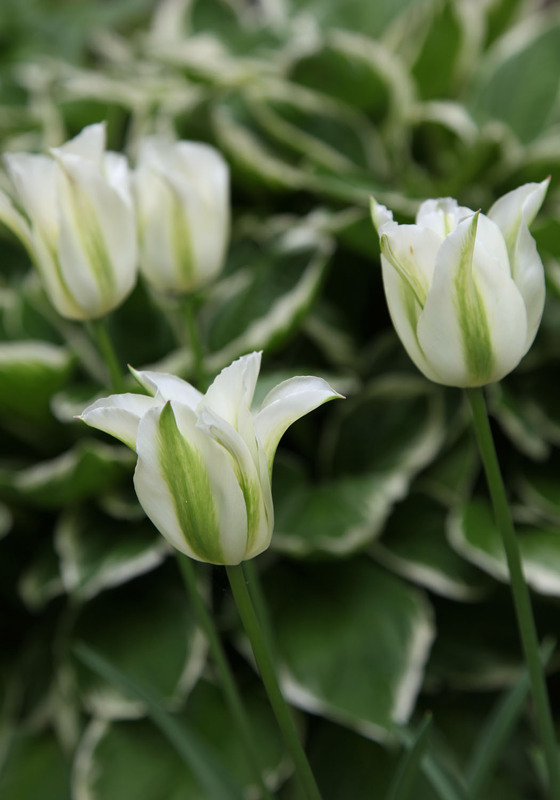 I think my favorite tulip remains to be the Viridiflora variety. I like how this one pairs with the hosta. These also seem to be fine in this partial shade location (they just bloom a couple of weeks later than their sunny friends). 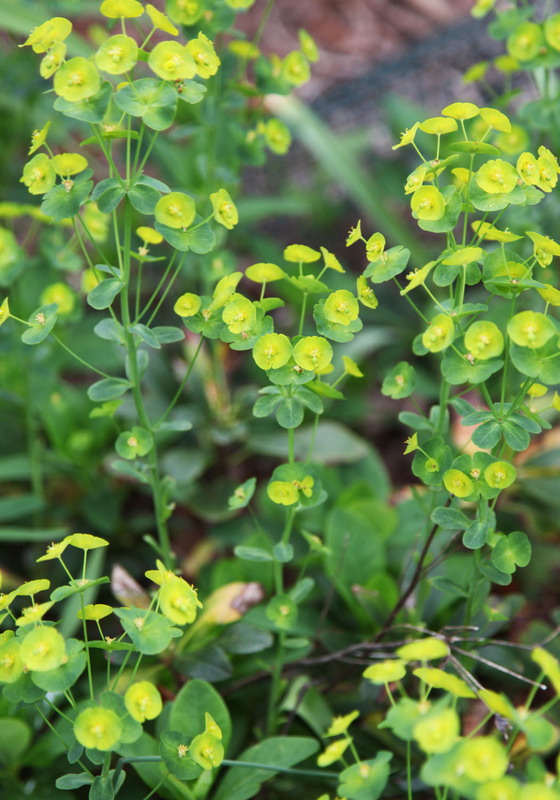 Lastly I wanted to highlight Euphorbia or spurge. I picked up mine at the Scott Arboretum plant exchange, where there always seems to be plentiful quantities. 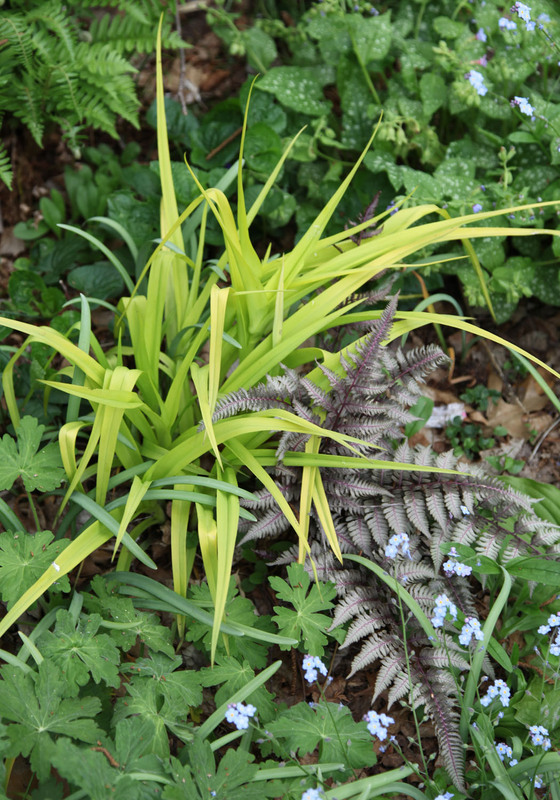 It was one of those plants that I wasn’t that into but I was looking for something that would do well in deep shade under the pine tree and I also put some in a partial sun position as a filler plant. The sap is poisonous, so I have been careful to keep it behind other plants to minimize the chance that the kids will get near it. And the verdict, the one in deep shade hasn’t bloomed but did fine all last summer in the dry weather and the one in partial sun look like this! 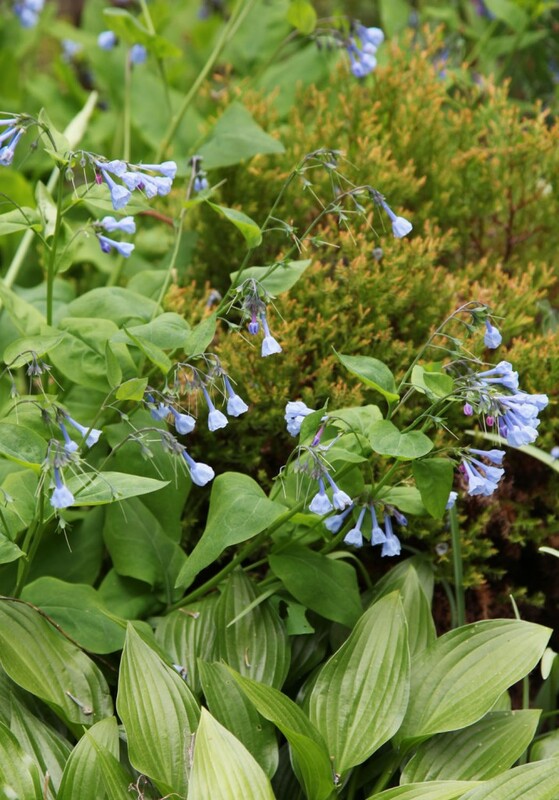 I am thinking I might pair it with the Virginia Bluebells, although it is a lot more aggressive than the bluebells and could overwhelm it. 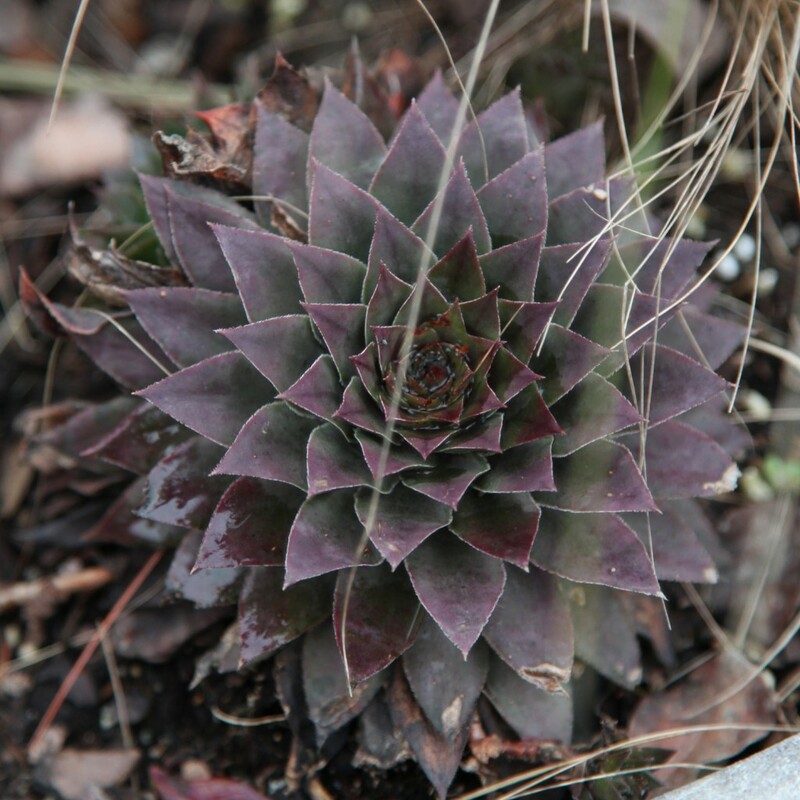 This weekend is the Scott Arboretum Plant Exchange, one of my favorite events of the year. Who knows what beauties I will find this year. Stay tuned! P.S. My AC contractor is suppose to be here later today with the Air Handling Unit for the Third Floor. I am so excited! I guess all it takes sometimes is a week of warm weather to get everything growing! This past week has been pretty epic in terms of how fast everything has grown and started flowering. We also managed to finally install the vintage chimney pot in the garden. I am planning on putting some sort of pot on top, although I haven’t found anything suitable yet. We found a date of 1916 on the top. In the meantime I will spend my time imagining the big chimney that this sat on. 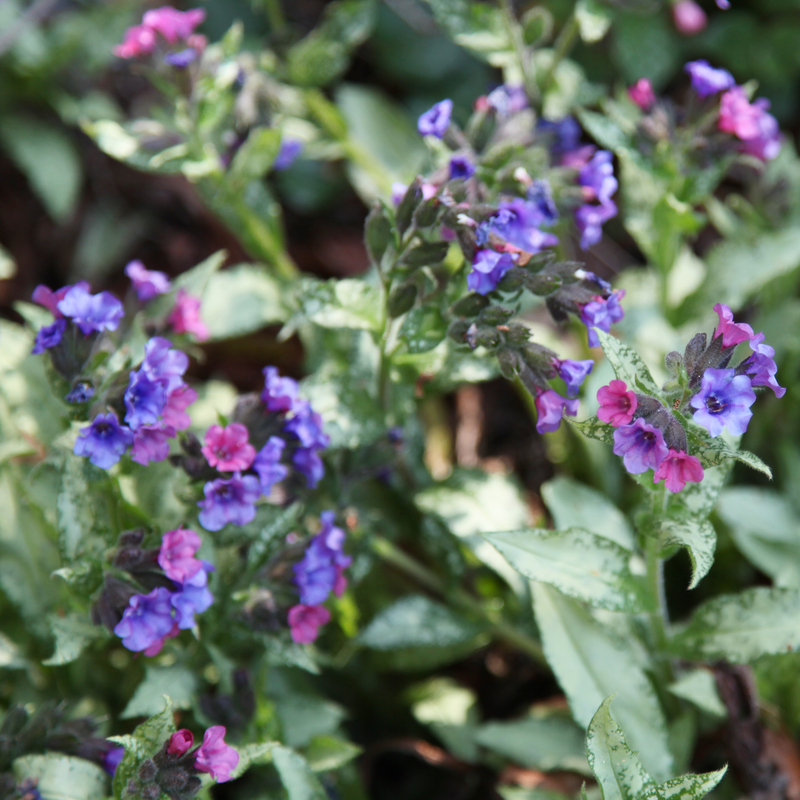 My lungwort has been blooming like crazy. It could actually use some dividing. I love the mix of blue and purple flowers on the ‘majeste’ variety. The whiteness of the leaves is also nice later in the season. The only downside is that when you transplant them, they are really unhappy for a few months. By the fall they usually are regrowing nice new leaves, but they spend the summer looking half dead. The Virginia Bluebells have a similar flower to the lungwort, but are quite a bit larger. These are a favorite of mine. 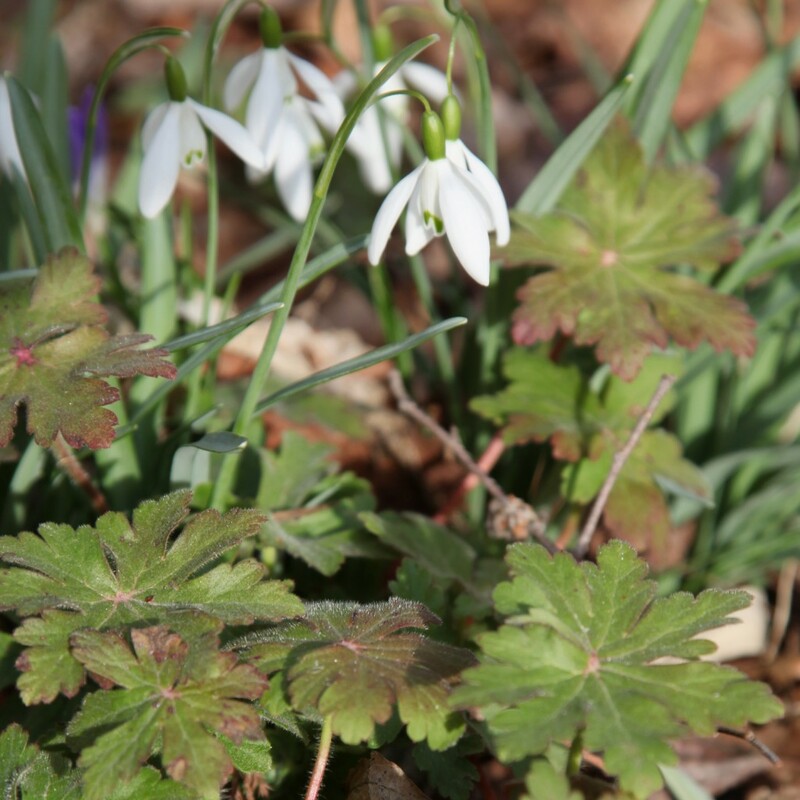 They have been slowly expanding in several clumps in my side garden (in part-sun). They leaves are a really nice vivid green and I really like that they are a native plant. Another native that I actually planted at the same time as the bluebells is the trillium. Both of these were planted as ridiculously small root stock that took a full year to come up (I had actually abandoned all hope). The trillium is really a lovely little jewel in the shade garden. They don’t last very long, once the heat of the summer sets in they will disappear until next year. 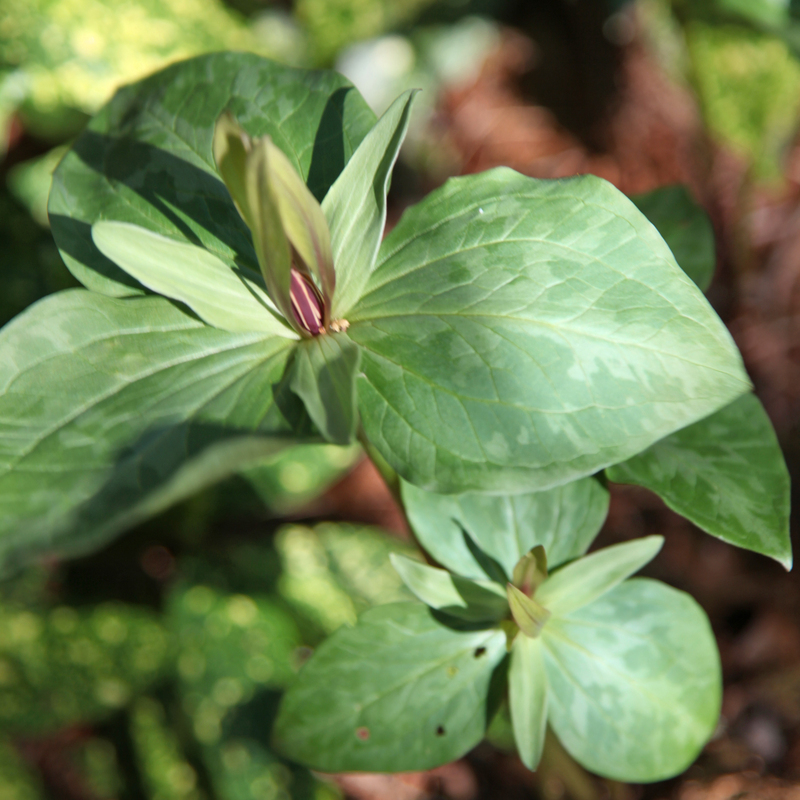 The leaves on the trillium are really quite beautiful. I bought both of these on ebay from a place in Tennessee (whose name escapes me). There appear to be several sellers now selling the Trillium and Virginia Bluebells. 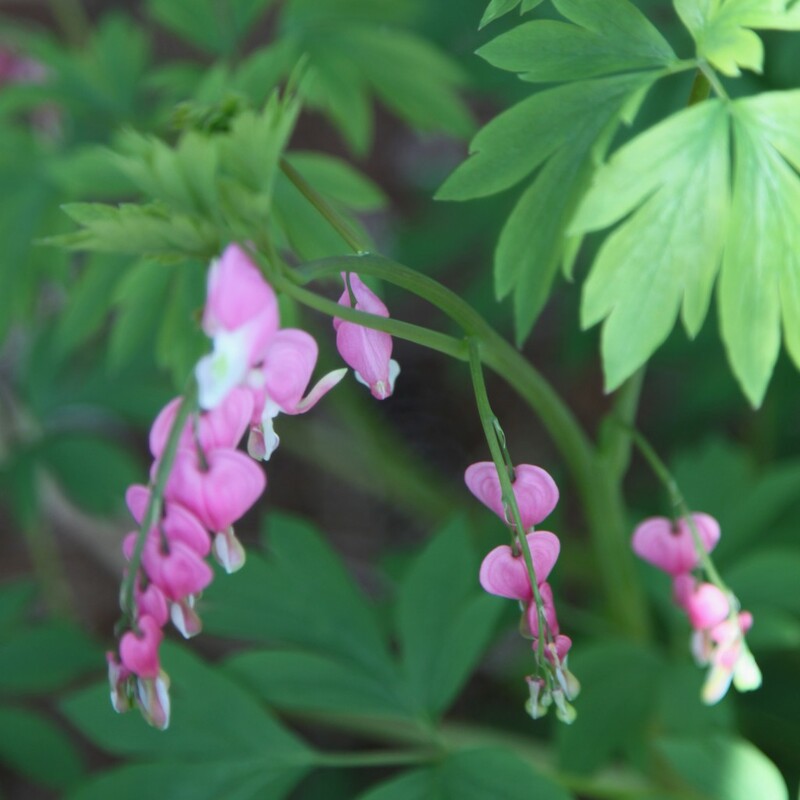 Another shade plant that has shown up out of no where are my Bleeding Hearts. They were literally a few inches tall last week and now the larger ones are over 18″ high with flowers. I don’t usually choose pink flowers, but I will always make an exception for these shade loving plants. Mine have also grown large enough to divide and I have been adding them to several of my planting beds. Finally I would be remiss if I didn’t mention my Kerria Japonica. It is a bit of a weed (it sends out little runners) but it gives such a good show this time of year. I like to cut it back a little bit later in the spring, but right now I am enjoying this at both my back gate and side gate. This plant will grow in almost full sun to shade. The only down side of the sun location is that the flowers bleach out. 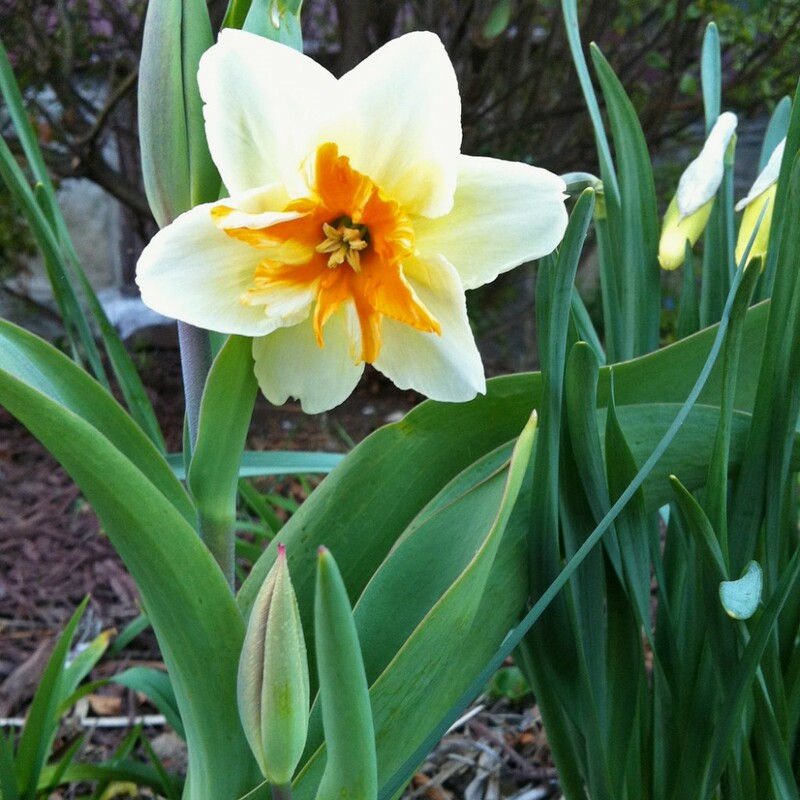 To take a peak at all of my garden blooms click here. Spring is finally here! We have reached the week in the spring where EVERYTHING makes an appearance. Granted it is still mostly little tiny sprouts and buds, but it is so nice to finally see all my little plant friends coming out of the ground. The weather has been warm for several days now, so everything is coming up fast. We were even able to be outside without coats! I managed to get a little bit of mulch down and part of the first round of weeding is complete. I was comparing this week to last year and we are almost a full month behind (granted we were a month ahead last year). 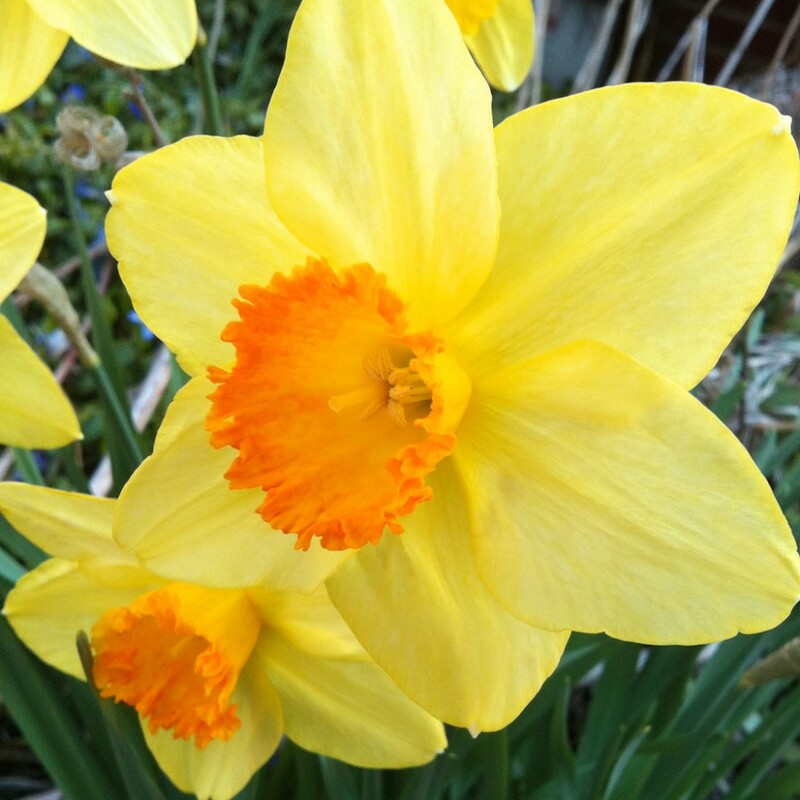 The daffodils have been in bloom for about a week now. Most of ours line our front steps, which is always a welcome appearance. I am actually thinking that I may divide several bunches this year, as the bunch is quite large and dense. That should allow them to multiply more, which is always welcomed. I may move some to the rear of the yard, to help add some additionally early spring blooms, especially since the squirrels and bunnies have eaten my crocuses even faster this year. 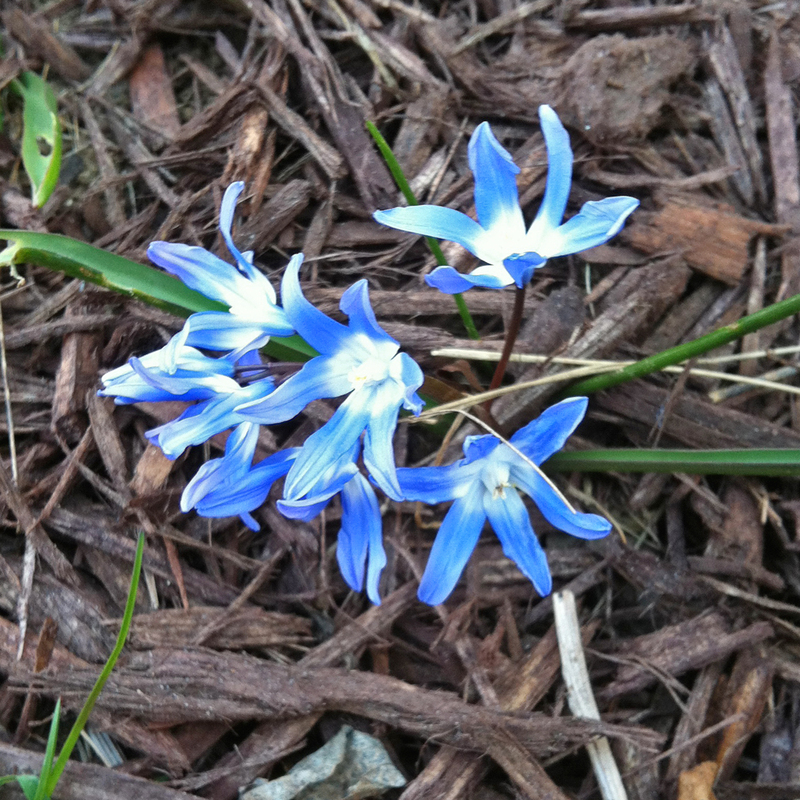 Also in the front yard is the Chionodoxa. Most of these are planted to the right of my front steps. 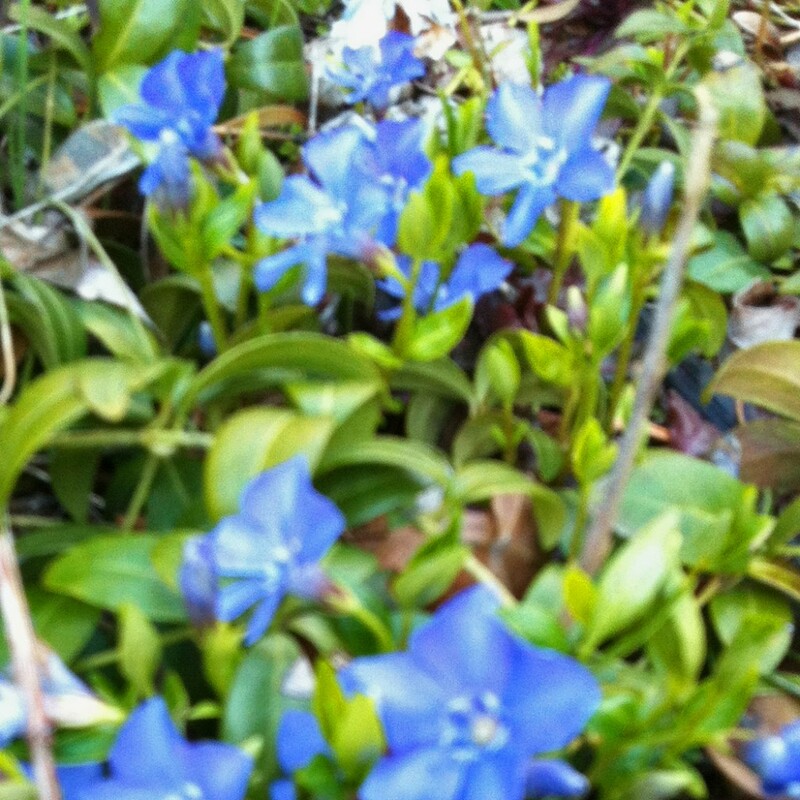 They are there to replace the purple flowers from the vinca. 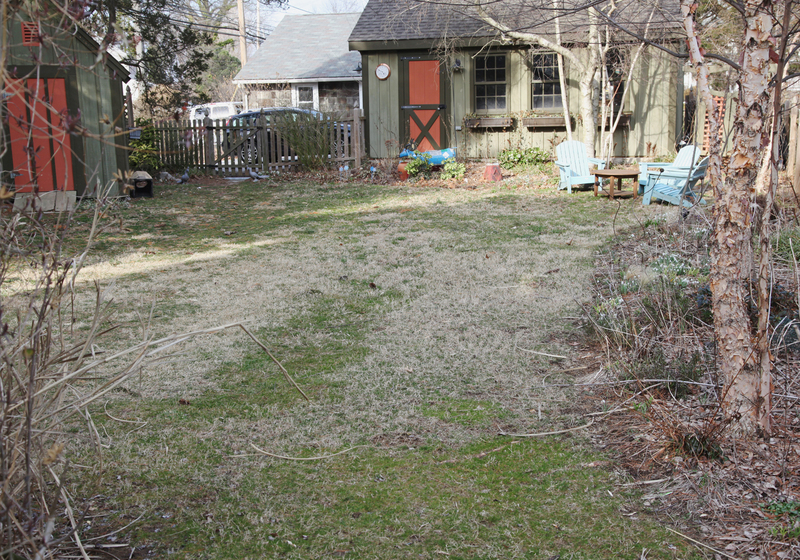 An ongoing battle for me is to remove the vinca front the front yard (I have almost removed it from one side but in the meantime the other side has been OVERTAKEN by it). It is VERY aggressive, but I have had a soft spot for it due to the purple flowers. It is actually one of the first things I wrote about when I started the blog. So 2 years later, I think the chiondoxa is a good choice, although I need A LOT more. The good news is in their second year blooming they have definitely come back stronger. I was a little disappointed last year, so much that I didn’t order any this past fall. Now I know that I need to order several hundred more (fortunately they are cheap and easy to put in since they are so small). 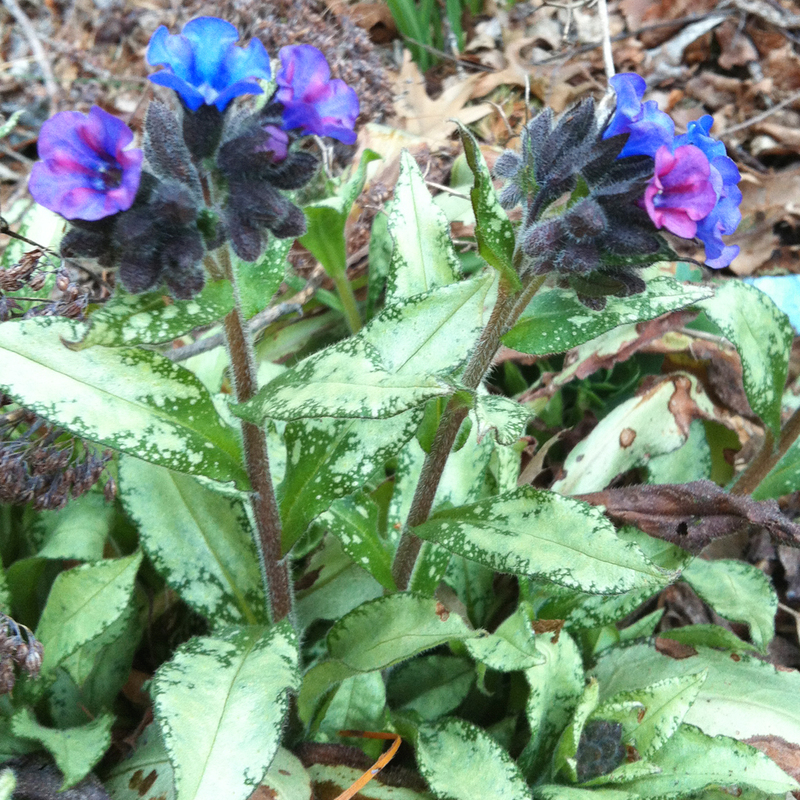 Speaking of purple flowers, my lungwort just started flowering. 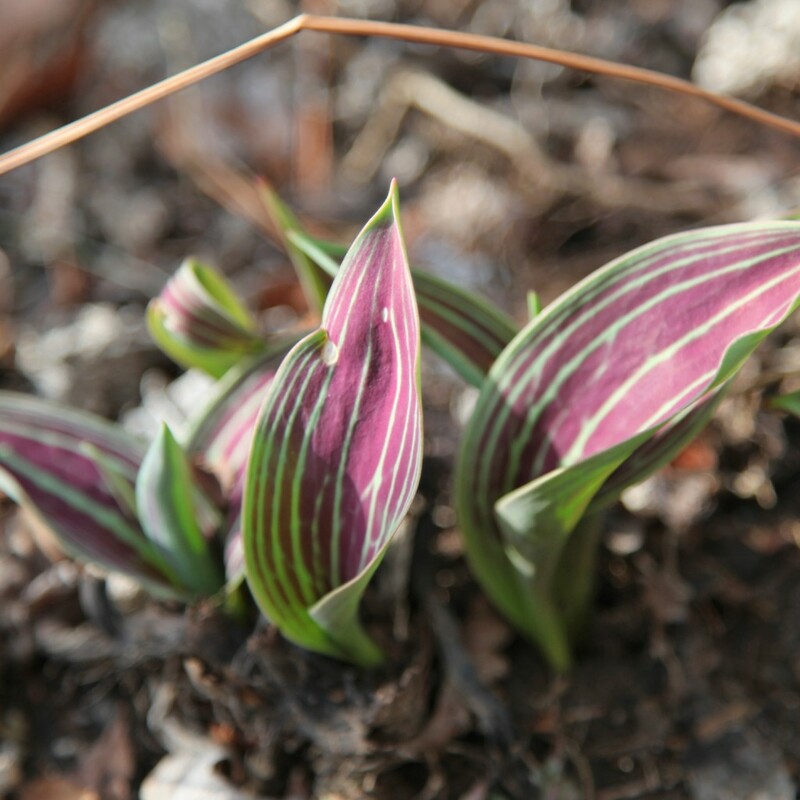 It is a favorite of mine, variegated leaves and purple flowers. The only caveat is that it doesn’t like full sun, so it isn’t an option for my front yard. This is another plant that I will be dividing this season. It actually looks terrible when you do it and you think it might not make it, but then it come back the next year all happy. 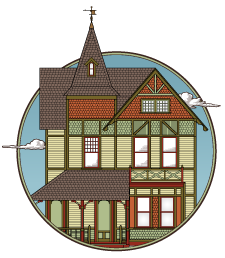 I will be back with some progress on the upstairs hall soon! I was suppose to get this post up yesterday, but well it didn’t happen. I did manage to get out into the garden very late in the afternoon to shoot some photos though. I realized that I need to get out there to do some weeding and mulching soon. My neighbors were out last weekend prepping their beds! Now I just need some warm weather (it is actually snowing outside at the moment). I thought I would show the sad state of the yard right now. The grass needs some MAJOR help. And the planting beds are looking bare at the moment. 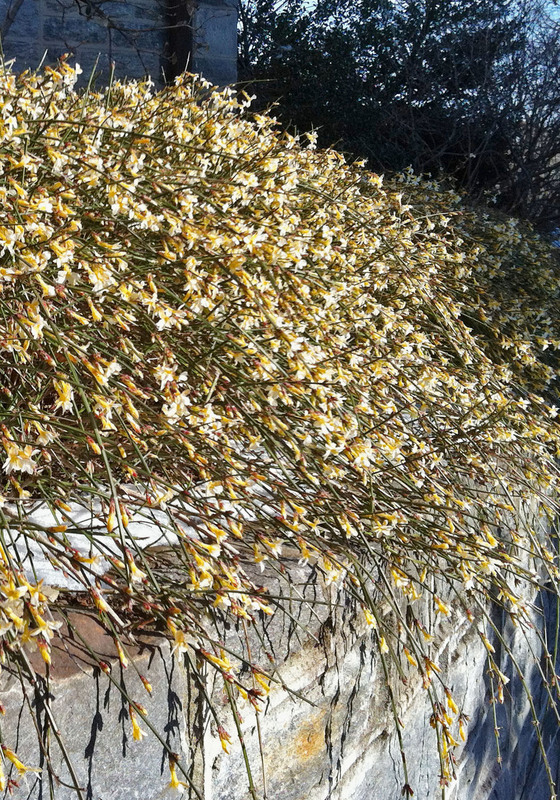 I’ve been trying to think of ways to add year around interest and even have 3 miniature heavenly bamboo to put in (which have been overwintering behind the shed). It is interesting to see how it compares to last year. We are definitely not as far ahead. Last year the daffodils were blooming (and I would say we have another 2 weeks before that will happen). 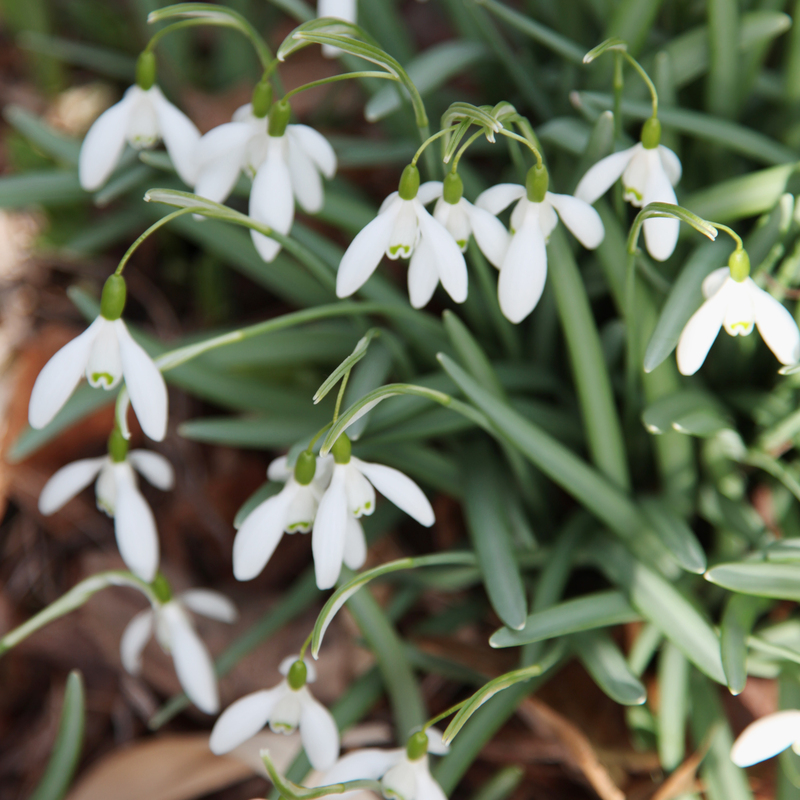 The snowdrops are usually the first bulb to bloom in late winter. I actually think that they may be behind schedule. They often bloom in February but mine just started blooming in full last week. Most of mine are transplants from around the yard (I think this is the only “free” plant that came with the house). I think it survived because it can grow in the lawn. The only downside to them is that I inevitably dig a bunch of them up by accident since they die back fairly early. Although I think that may help with the multiplying, as I usually spread out the bulbs when I do come across them. 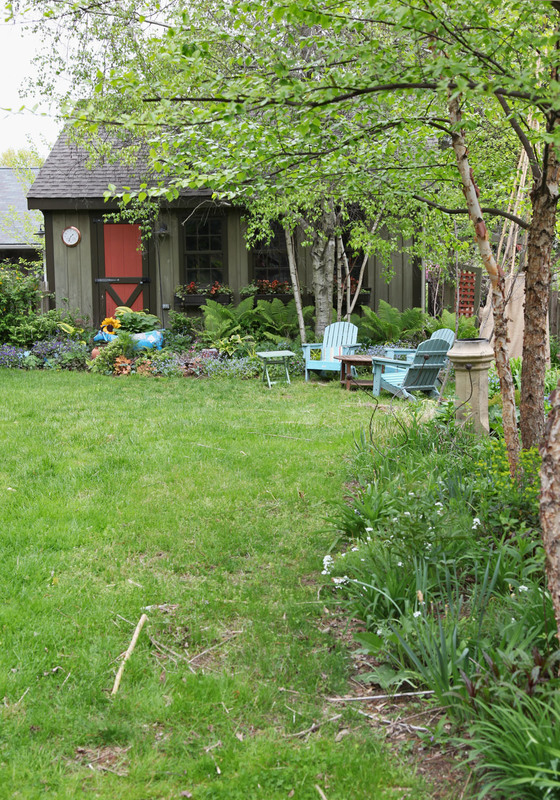 If you look closely at the picture of the backyard you can see them scattered in the side and rear planting beds. 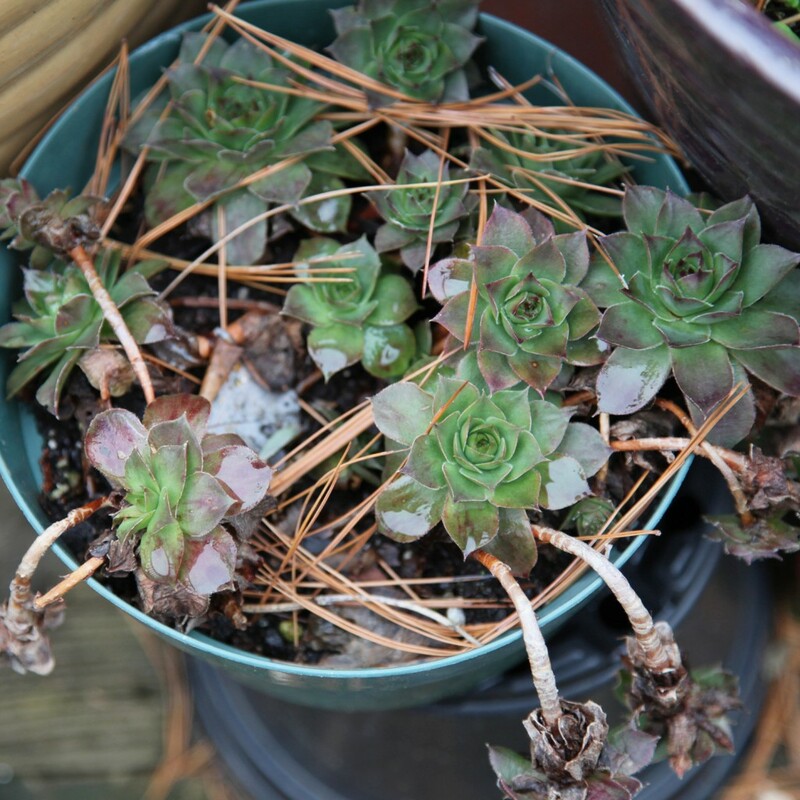 In the picture above you can see them with some geraniums which managed to overwinter without much complete dying back. 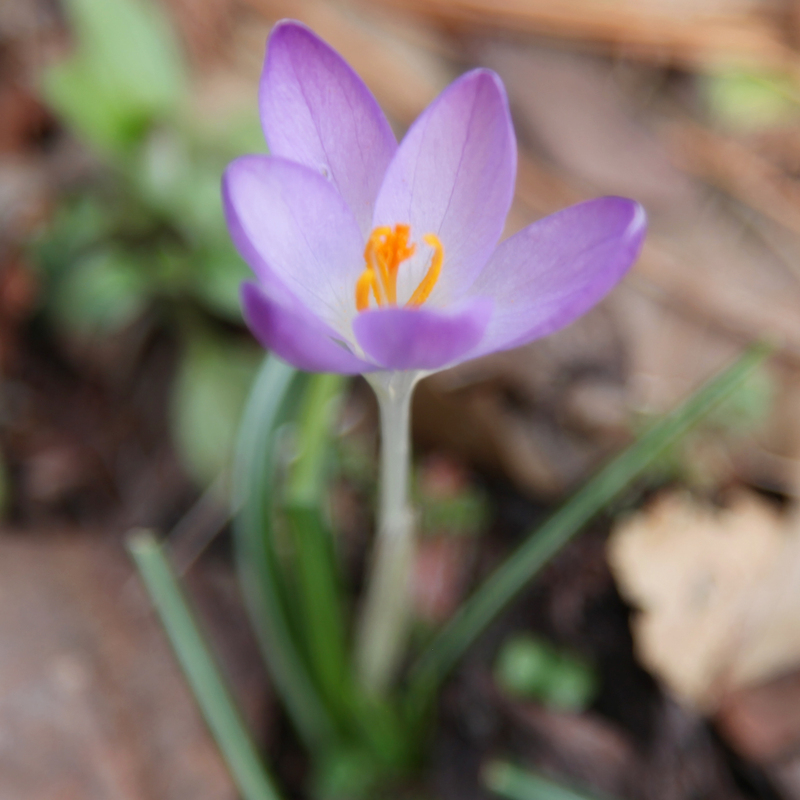 While we are on the subject of crocuses, here is the Barr’s Purple. I LOVE the color and they are suppose to be squirrel resistant but something likes to munch on them in my yard (yes I am looking at you bunnies!). I planted a lot of them in the fall of 2011. Then I admired them last spring and watched them disappear over 3 days, completely munched off. What I don’t understand is if you head over to Swarthmore (the next town over) you see lawns filled with crocuses. I guess maybe the bunnies haven’t made their way over there. hmmm…. 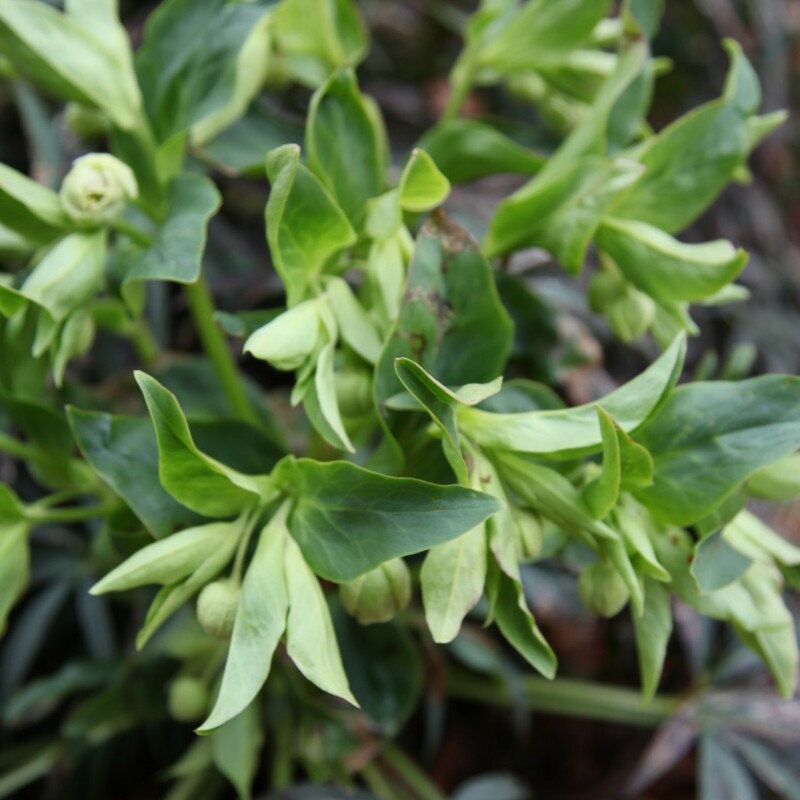 For the first time my Golden Lotus Hellebore is blooming! I picked it up from Carolyn’s Shade Garden in the Fall 2011. I bought 2. It looks like I only have 1 left and it didn’t bloom last year. I was pretty excited to see in now though! It is currently facing away from the house, so I had to really lean down to get this shot. 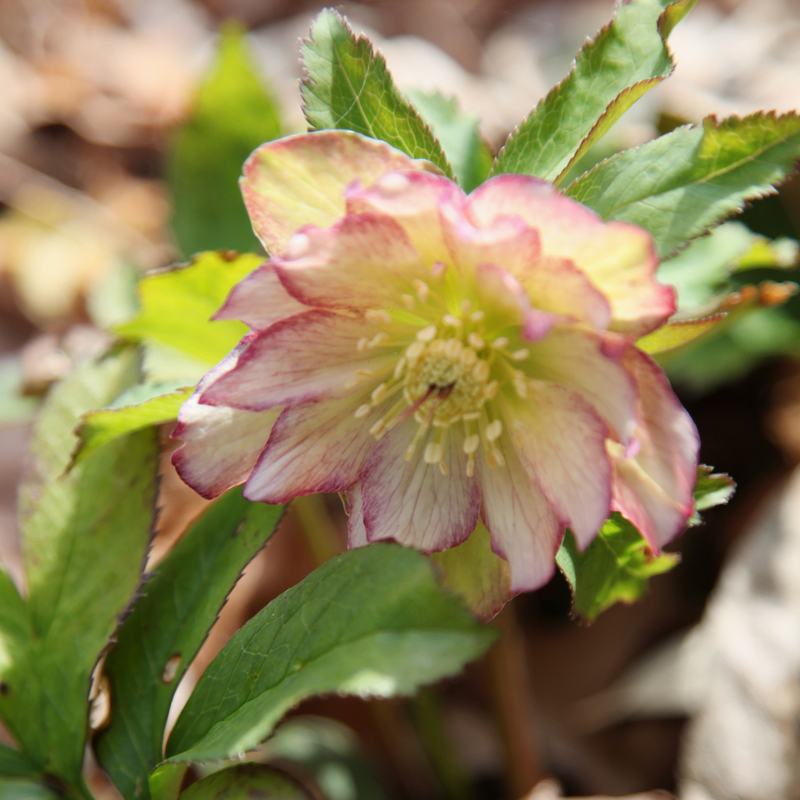 It is a double hellebore and is quite pretty in person. 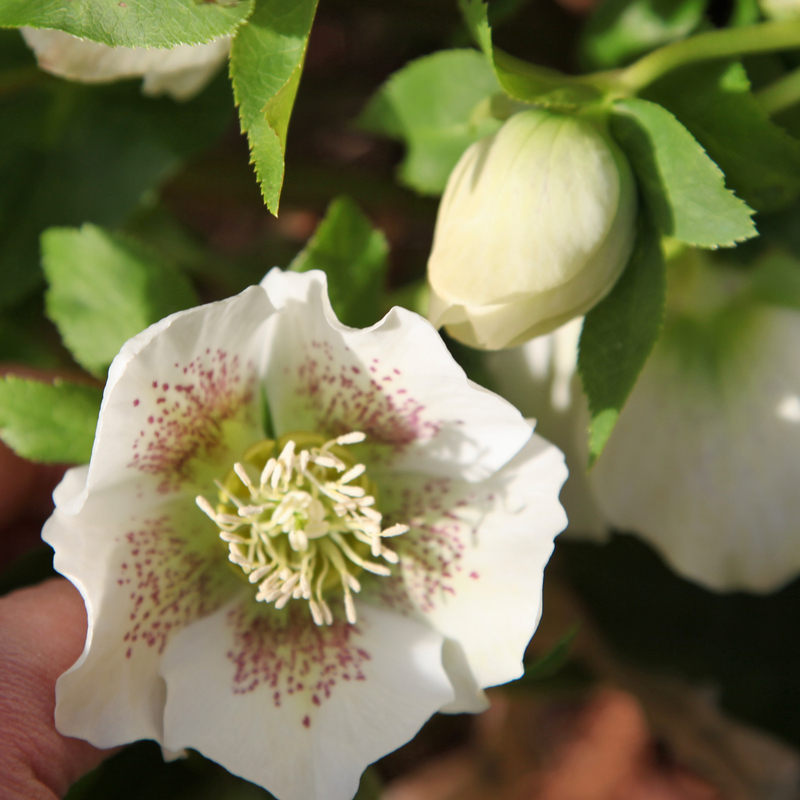 My regular hellebores which are a mix of white and white with a purple edge are also blooming. This patch, which came from a friend, started off fairly small but has turned into quite a nice grouping. I have even spread some of the seedlings around. Unfortunately the seedlings are still too young to bloom, but they seem to have settled in nicely. I wanted to show off the leaves of these tulips. This is Red Riding hood from Brent and Becky’s. I bought these probably 6 years ago or so from them. It produces small red flowers that sit low the ground, but the leaves are really the star. I’m also impressed that they have come back so well, since most tulips tend to die back after a few years. 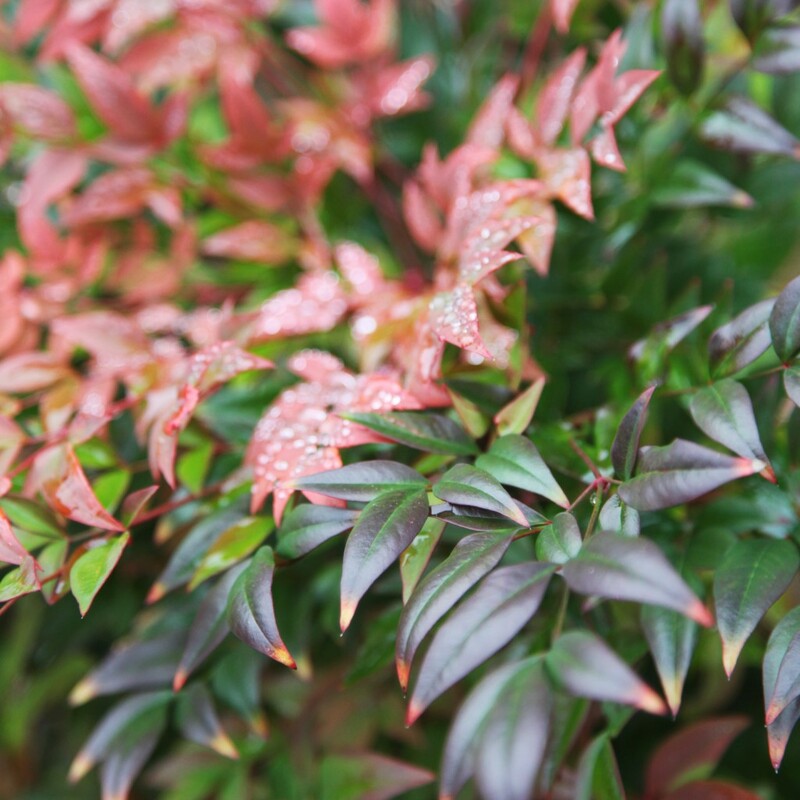 Finally I will leave you with a picture of the heavenly bamboo (nandina ‘Gulf Stream’) in the front yard. I planted these in front of the bay window back in the Fall of 2011. They have filled in so nicely! My plan actually worked! And as a bonus they max out at 30″ tall, so no pruning required! I still need to do some more planting around them, but It is nice to have year around color here. I was over at Target last week and they have all of their spring/summer outdoor collections out on display. Aaaaaahh…thoughts of spring! 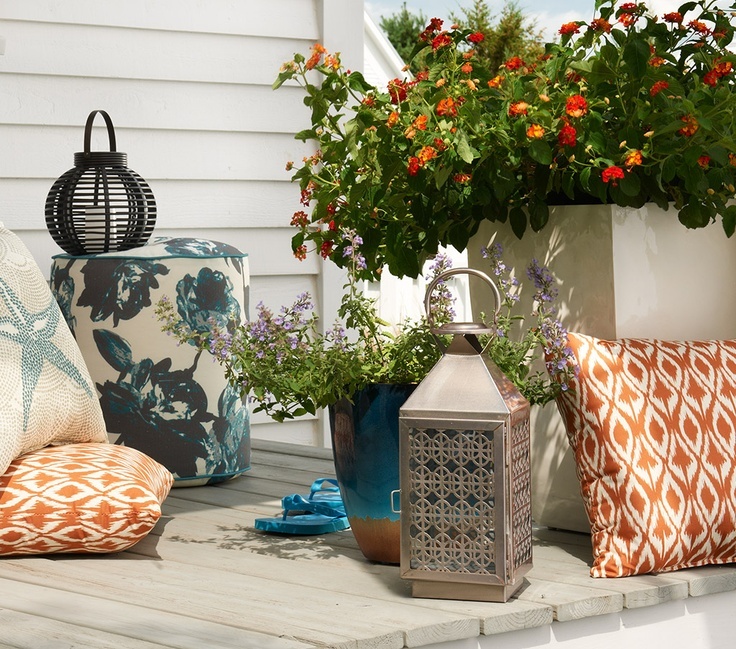 They also had a nice their Patio Look Book 2013 available, so I quickly snapped one up! I know I am suppose to be focused on a certain third floor, but sometimes you need a quick little diversion! 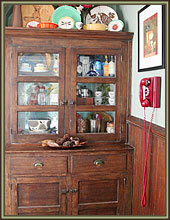 So I thought I would show you a few of the items that caught my eye. I don’t actually NEED much for the outside but a little virtual shopping is still in order. Above I am totally digging the Moroccan style metal lantern, round blue and white ottoman/pouf and the blue pot (which is actually durable resin). Their outdoor rugs are also looking really nice this year, although the prices are a little higher then I am use to. 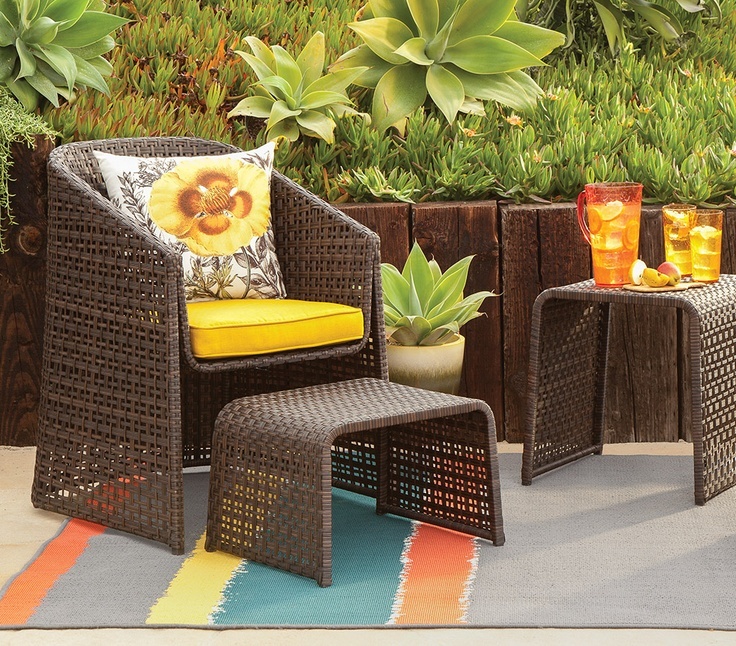 This wicker set is pretty cute. I actually reminds of something CB2 would sell. I am also really in love with the pillow. More of these faux-ceramic resin pots. 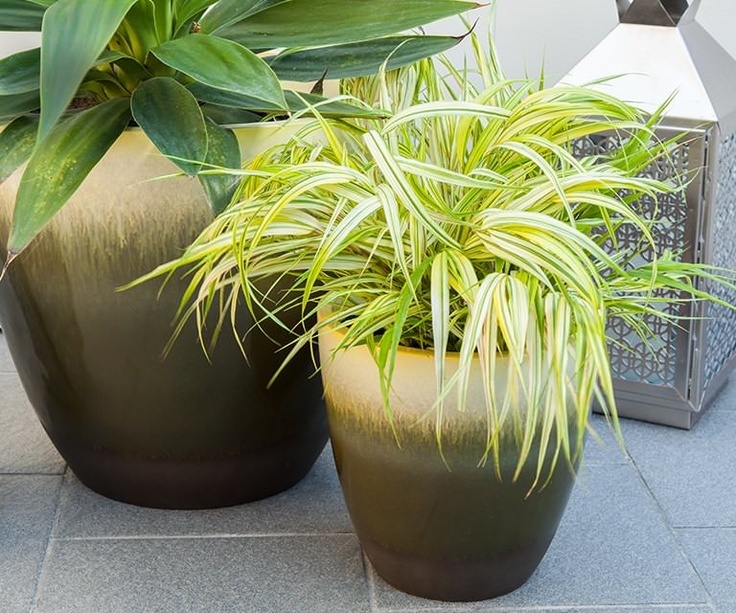 I hate having to bring pots in over the winter to avoid problems with frost and these at least in the pictures look like a great option. Plus the resin ones tend to be lighter! I am also digging the hakonechloa grass in the pot. This could even possibly be left in the pot over winter (in part sun to shade). 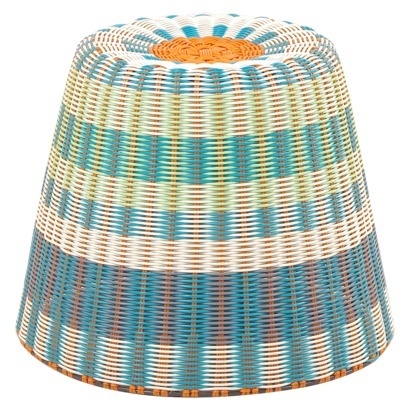 I am also liking this colorful wicker ottoman. I don’t have a place for this but I like the option of using it for a seat, a table or even turning it over and using it to store stuff. At $39.99 it is a little more than I would want to spend, but I will have to check it out in the store next time. 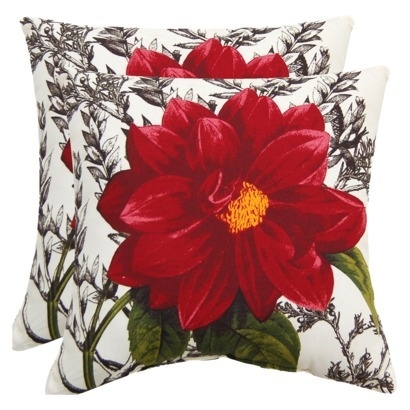 I think the one item I may actually consider picking up are these really cute outdoor dahlia pillows. At $15 a piece, I think that they may add some drama to the backyard. Time to get back to thinking about a certain upstairs space! On Sunday we went for a family walk around Swarthmore College (aka Scott Arboretum). The kids were quite happy running around in the cold. I find it so easy to hide away in the winter but the kids are good at reminding me that fresh air is a good thing! After an hour Sam was disappointed when I told him it was time to go home. 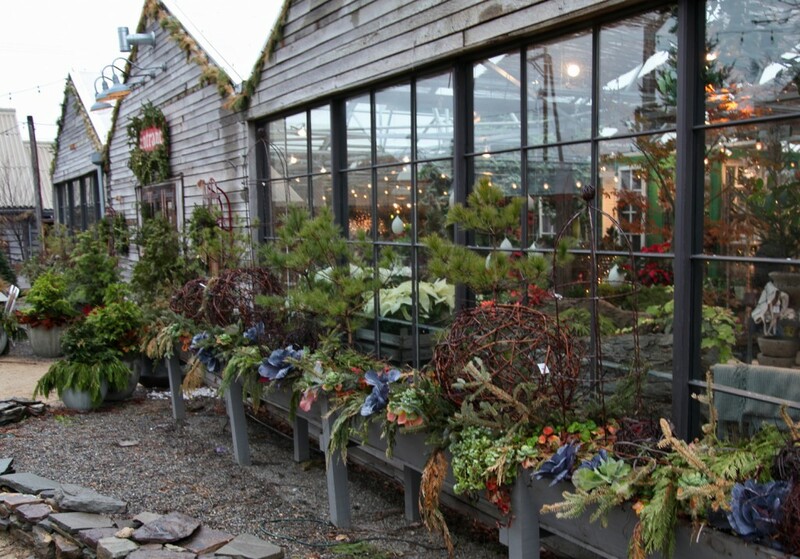 While we were there I made it our goal to find some pretty winter interest plants. I really loved these hydrangeas. These had such a great structural quality that I liked against the snow. 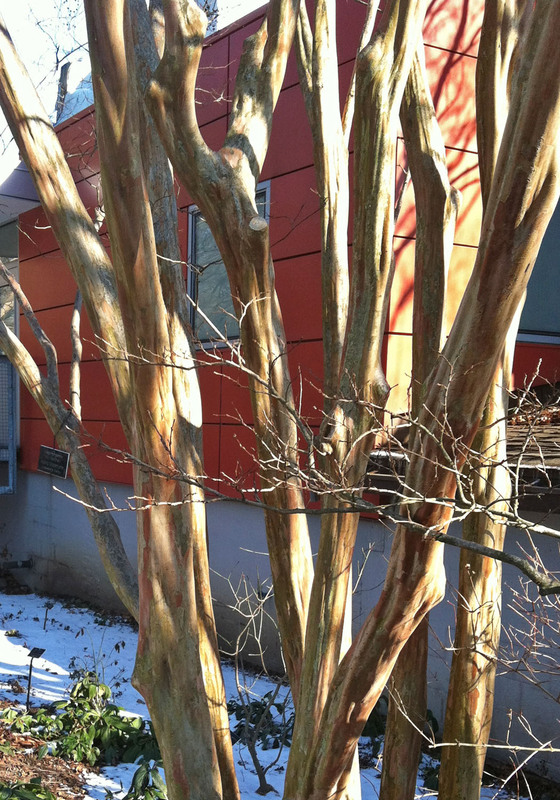 I have admired this particular crape myrtle (Natchez) on several occasions. 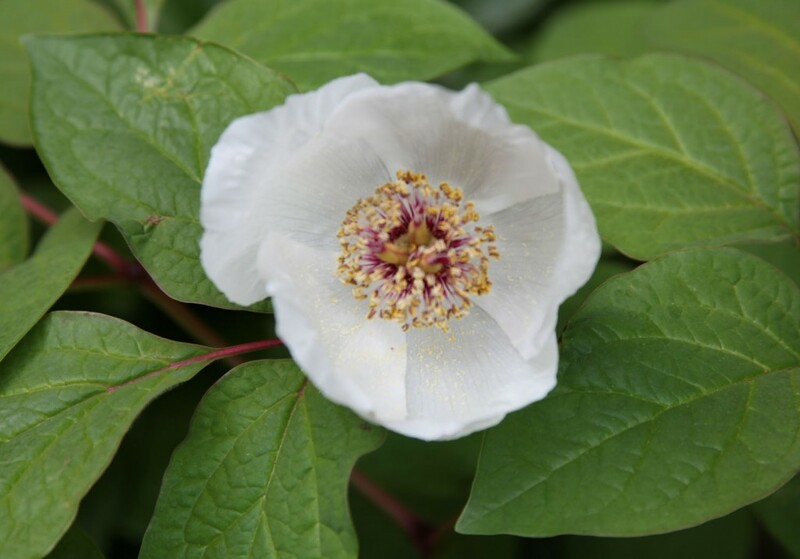 It is quite a large specimen and has lovely white flowers at the end of the summer. This variety apparently grows to 30′, which this one must be close to. But the bark is the real show stopper as far as I am concerned. I don’t have a place in my yard for this, but if I did I would definitely pick one up. Although maybe this might be a nice tree for the front yard. hmmmm…. This Jasminum nudiflorum low grounding shrub I don’t know what the name of this ground cover is, but it was quite lovely and was taking over quite a large area of hillside (thanks to Carolyn for identifying it). 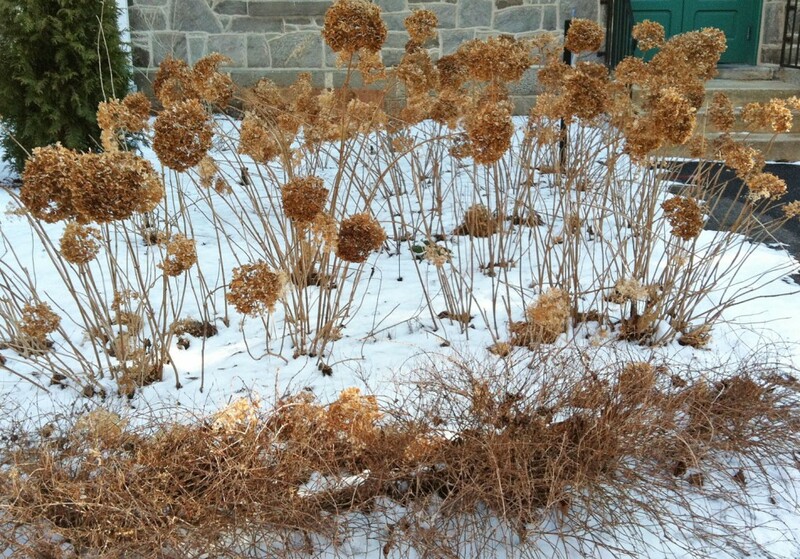 I have a few astibles in my yard, but I don’t think about them as offering winter interest. This garden made me rethink this. These are ‘Vision in Pink’, which look great considering that these flowers have been out like this for months. I suppose it is about planting several close together to get this effect. Edgeworthia is new to me. 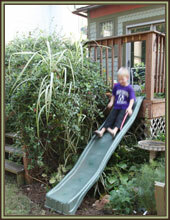 Carolyn from Carolyn’s Shade Garden wrote an excellent article about them in December. I was quite intrigued by the post, where she included this particular specimen at the College. I was happy to see it in the middle of winter. She is suppose to have a few of these for sale this spring. Again, I don’t have a place for this, but it is really quite stunning. The buds are fuzzy, how cool is that! I have no idea what type of vine this is (wisteria?) 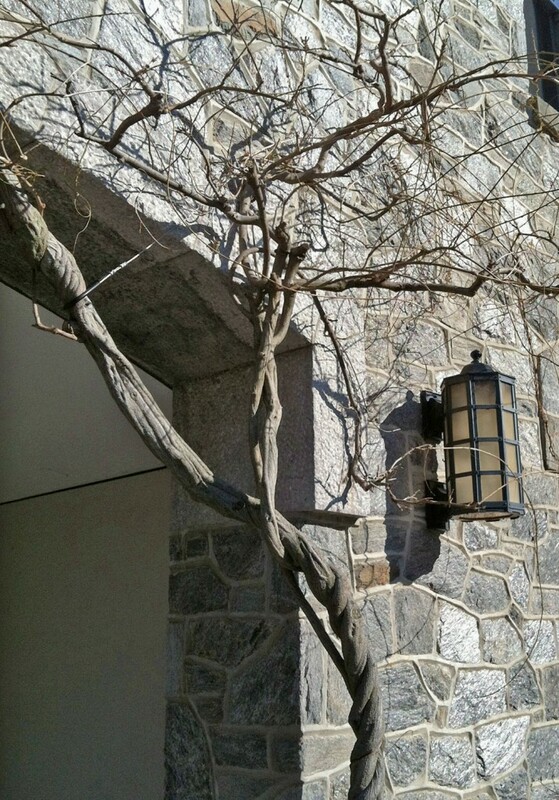 but I thought the shape was stunning against the stone wall and lantern. 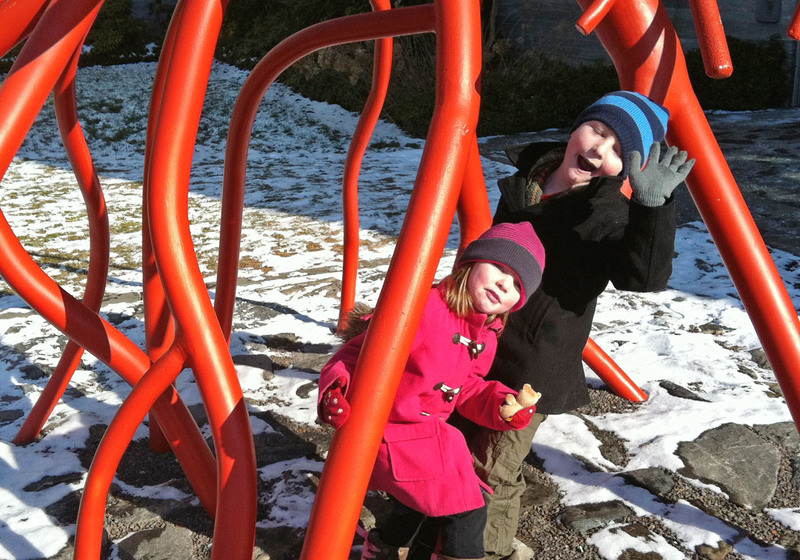 Finally here are the kids playing in a sculpture. Clearly we need to have some more outdoor winter adventures! Does anyone have any recommendations for places to go around Philly? I was thinking that Chanticleer Garden might be fun, but it isn’t open this time of year. This is a little off topic, but it is important so I wanted to share. 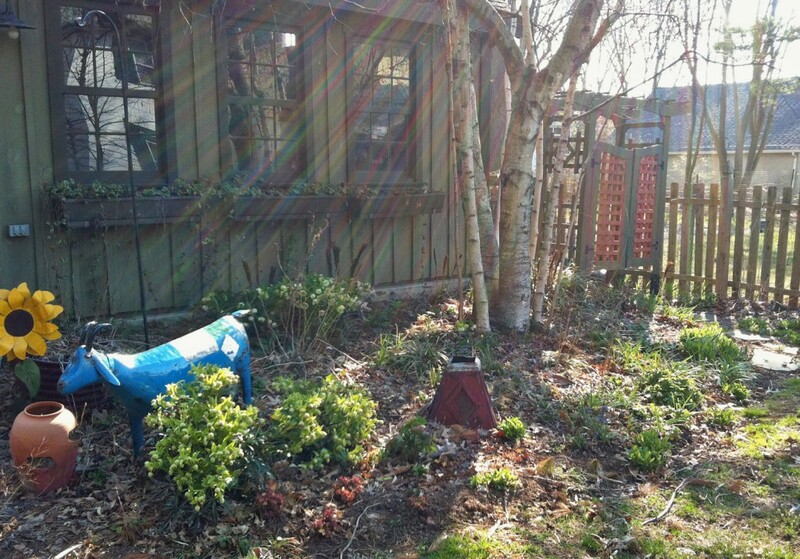 The Camden Children’s Garden is being evicted by the State of New Jersey and given two months to clear the site. So I am joining the Blogger Day of Action to Save the Camden Children’s Garden I am including some pictures from over the years (thanks Tim). 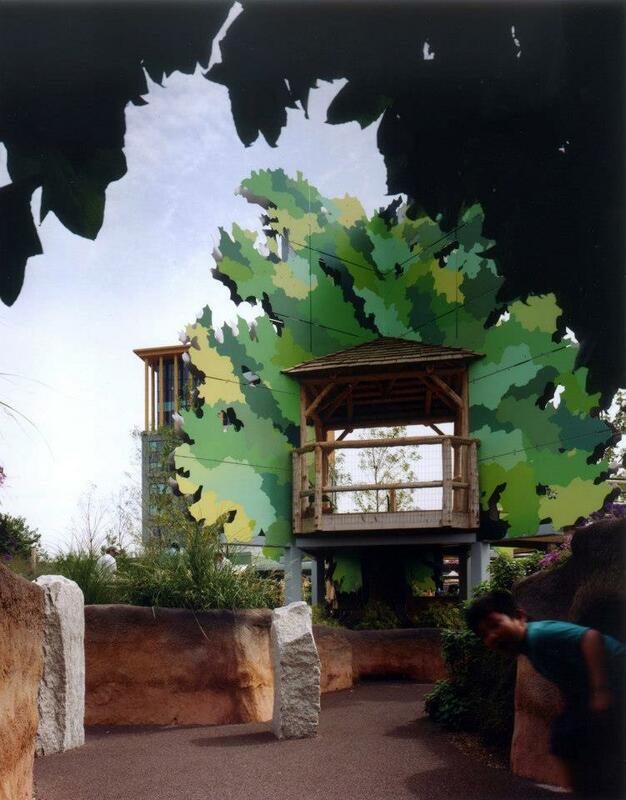 The garden was designed by Venturi, Scott Brown and Associates with Rodney Robinson Landscape Architects. 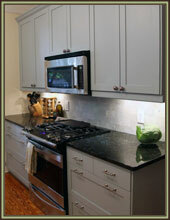 It was one of the first projects I worked on when I start at VSBA. I only worked on it a little bit but it was such an exciting project to be involved with and I still have fond memories of the opening party. 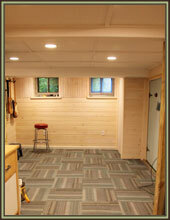 It is one of the best examples of Steve Izenour’s built work. Not only is the Children’s Garden a great place to take the family but they also do SO much great work in Camden supporting and running community gardens around the city and offering youth education, training and employment. Michelle Obama even highlights it in her book “American Grown”. 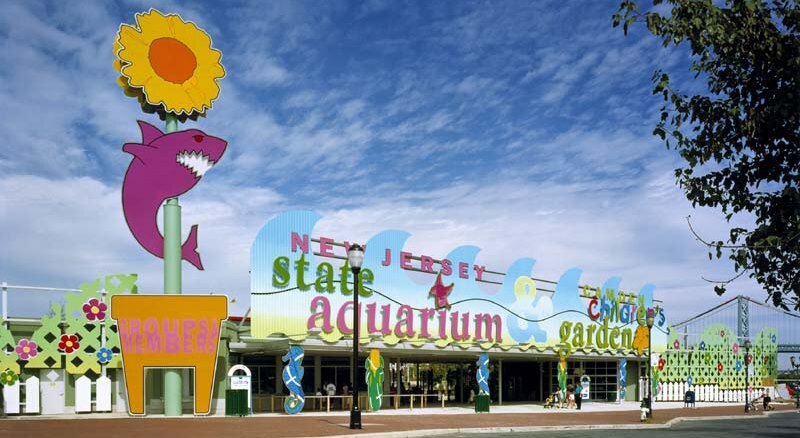 It is a sad day that the NJ would decide to take something with such positive impact to such an under served community and destroy it. 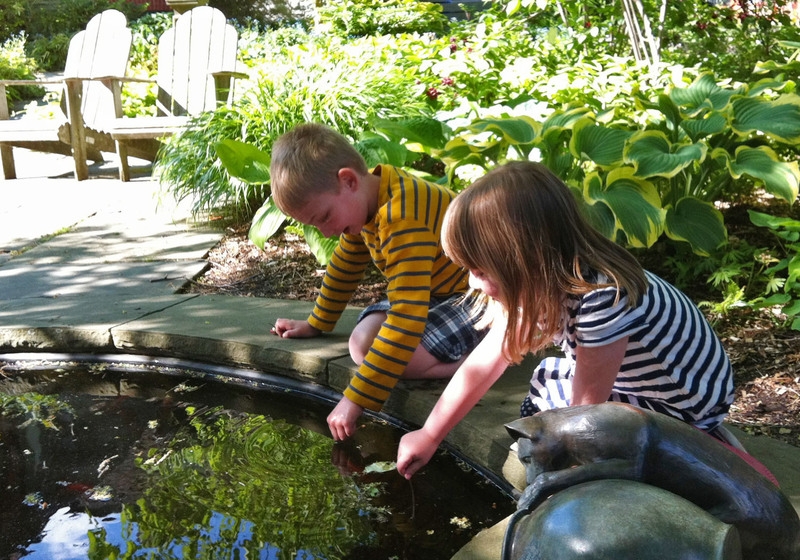 Please consider adding your support to save the Camden Children’s Garden. Sign the petition here. With the unseasonably warm weather I thought it was about time that I headed outside to check on the garden. 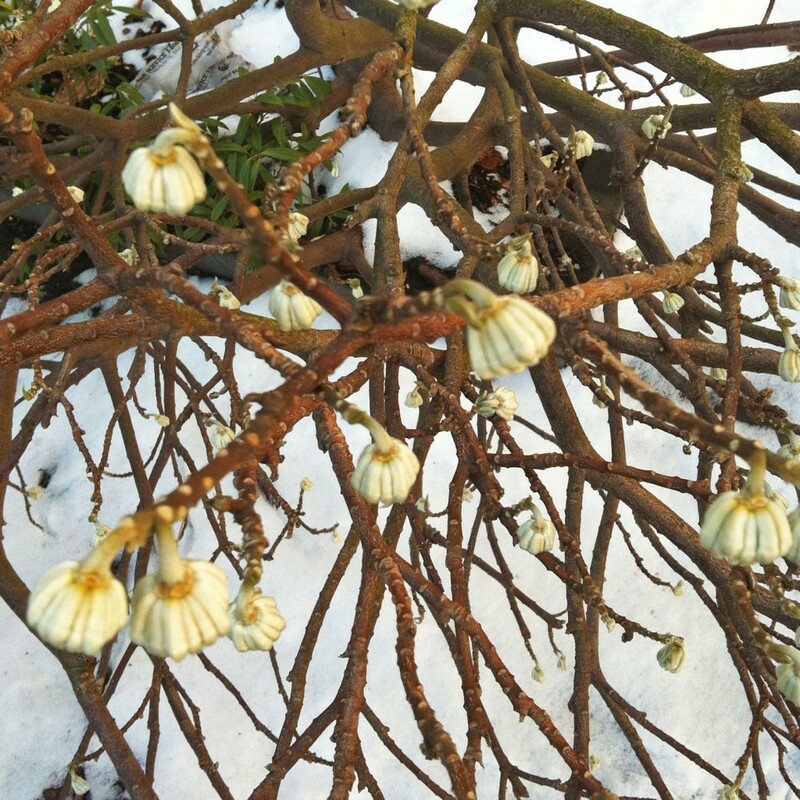 We have only had a couple of really cold days this season, so a number of plants are confused. 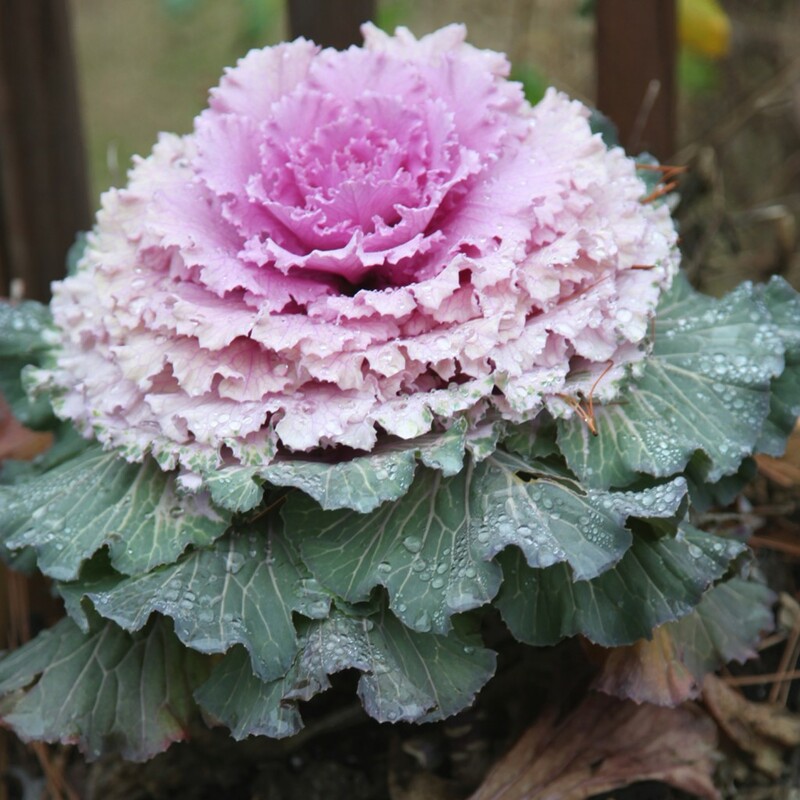 I have been very pleasantly surprised with a couple of the cabbages that I bought this fall. This is the first time I have planted these and I thought that they would be long gone by now. The pink ones are fairing better than the darker purple ones, but the fact that they aren’t all shriveled up but nice and full is impressive. A couple of my succulents (hen and chicks) have also been quite happy. The one above is in my front urn. The one below is still in the nursery pot because I never got around to planting it. I am really liking these little guys as fillers for my pots and planters. They tend to get a little lost when the other plants are in full bloom, but they sit there so nicely, helping to fend off the weeds. And now that most everything has died back, they provide nice texture and color. Both of these are mostly green in the summer, but with the colder weather have added a nice red to the tips. 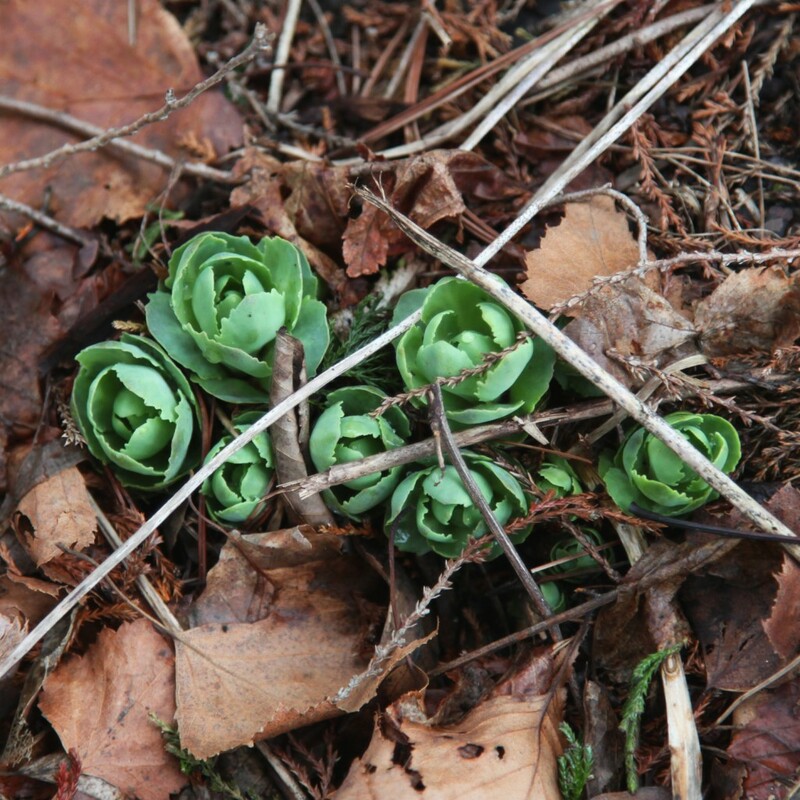 Speaking of succulents, my Autumn Joy Sedum are sprouting. I thought that they sprouted early last year at the end of February. I guess we will see if we get some serious snow or cold, how they fair. 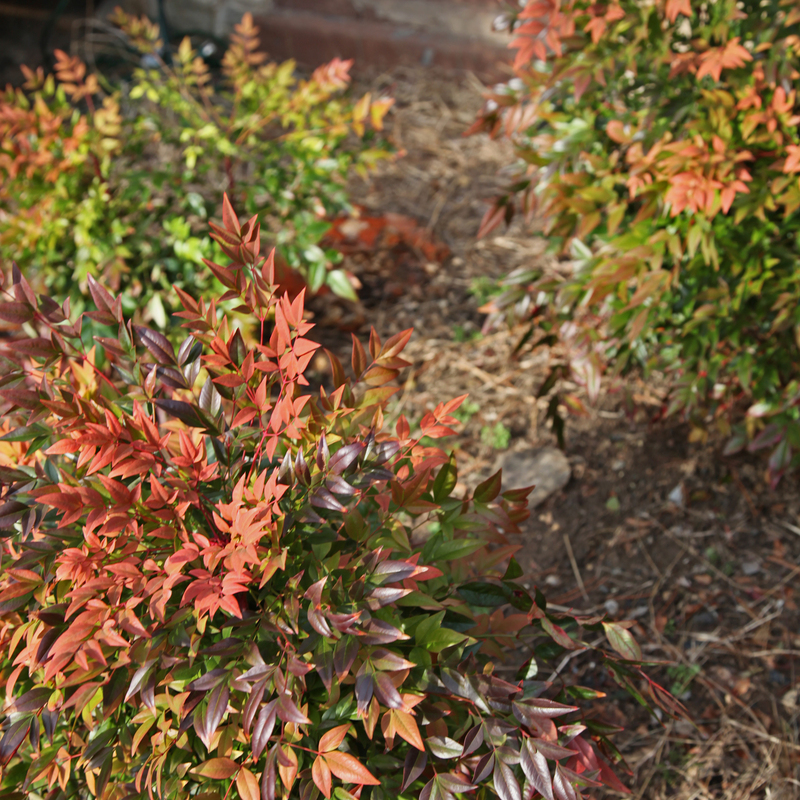 I am still in love with the Nandina Domestica ‘Gulf Stream’ (Heavenly Bamboo) that I planted in the fall of 2011. This miniature variety does not produce berries, but the colors are so nice and it looks so good this time of year (all year for that matter). I also planted a regular one with berries by our driveway and it is doing equally well. Finally I thought I would show you some of the hellebores. 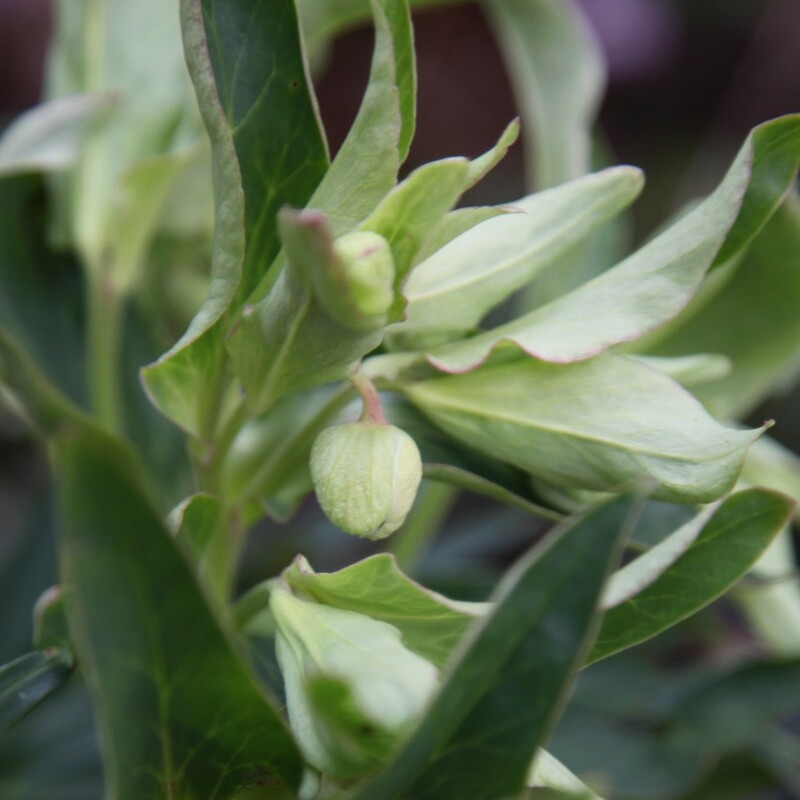 My main grouping of common hellebores have not started blooming yet, but this other patch of Helleborus foetidus are just starting to. I picked these up at the Scott Arboretum Plant Exchange a couple of years ago but this is the first time that they are going to bloom for me, so I am pretty excited about that. The only issue is that they are kind of tall, so I may need to do some more rearranging in the planting bed later this spring. Do you have anything interesting blooming in your garden? P.S. 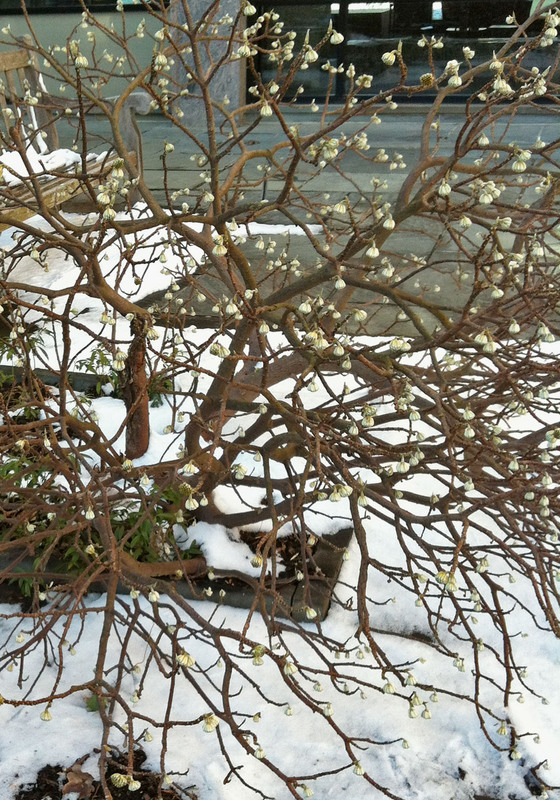 To see previous Blooming This Week posts (and imagine warmer weather) click here. 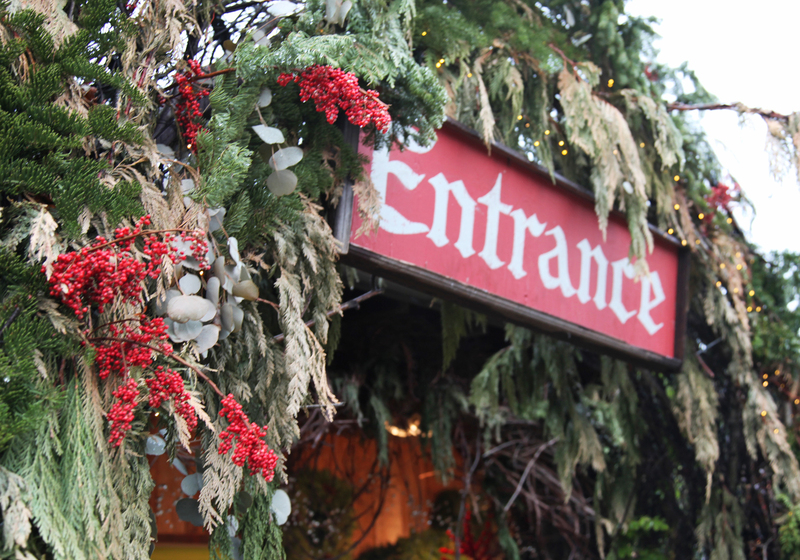 I stopped over at Terrain this weekend for some winter & holiday inspiration. The weather was dreary to say the least but it was still beautiful. I hope you enjoy the eye candy! The number of outdoor arrangements and plants was impressive! I wanted to scoop them up and bring them home! I think that they have really upped their game in terms of outdoor plants and exterior decoration. Of course most of them were REALLY expensive. The display makes we want a larger garden just so I could grow some of these plants for cuttings. Maybe I will stop over at Produce Junction and see what I could pick up to make my own outdoor arrangement. So stay tuned! I think this was my favorite arrangement. The colors and size was spectacular (over 4′ across). I think one of the surprises in their arrangements was the mix of cuttings with perennials. They usually do a nice job of mixing perennials with annuals, but this time of year all the annuals (with the exception of some of the cabbages are done for the season). They actually use quite a few small bushes (that were also for sale). I’m not sure if they are really dwarfs or just babies, I will have to investigate! I also thought the use of eucalyptus was brilliant. 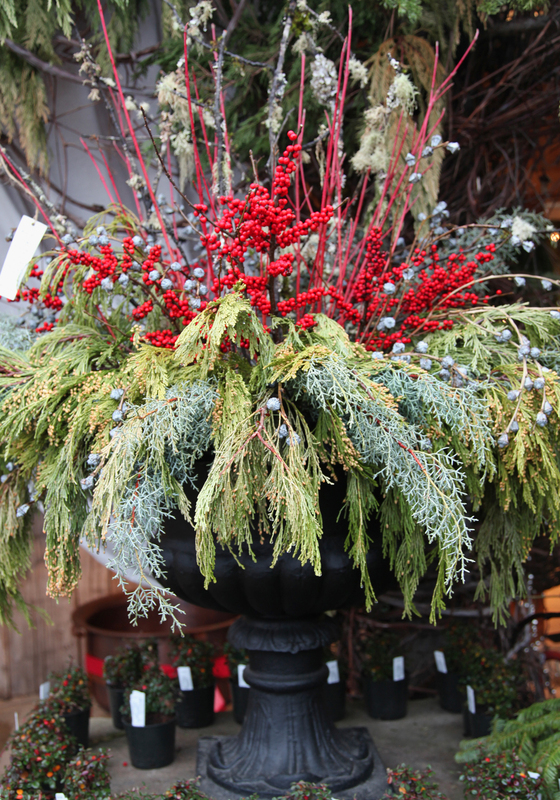 I think of it being used in boring interior applications, but outside it brought a new color and texture to the arrangements (and appeared to be holding up quite well outside). I like the use of heather here paired with the small cabbages. I just saw some heather for sale the other day locally and was wondering how it would fair outside. Maybe I will give it a shot. I really liked this arrangement, especially since I own all of these plants, and these are all readily available. 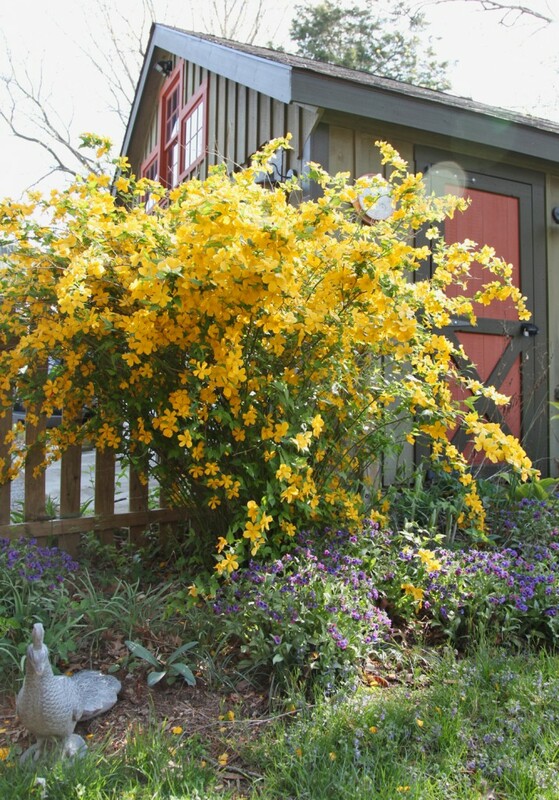 I actually have 3 miniature nandina sitting behind the shed waiting to be planted. Maybe I will throw a couple of them in pots on the deck for the winter. Also as long as the winter doesn’t get too cold the coral bells should make it through. I do wonder with the pot being exposed though how it might fair. Will the roots freeze? 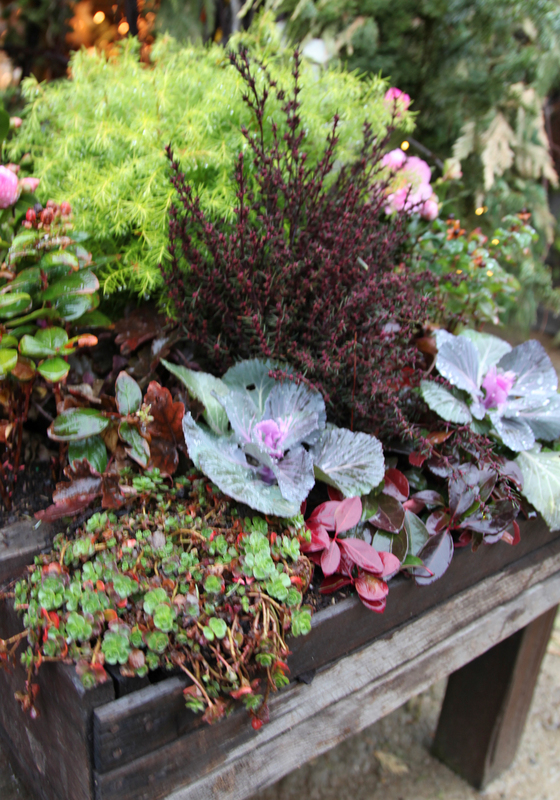 The window boxes were stunning. I have never seen the black cabbages before. I also liked these grape vine orbs. They have lights in them, but at $148 a piece, I may try to replicate them for my yard. I always have random weedy vines that I might be able to use to replicate this. 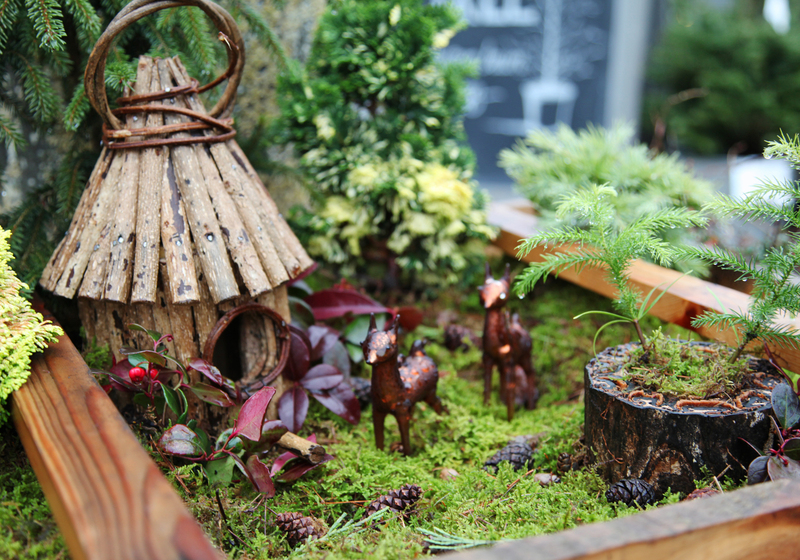 Finally, this miniature outdoor scene was splendid. 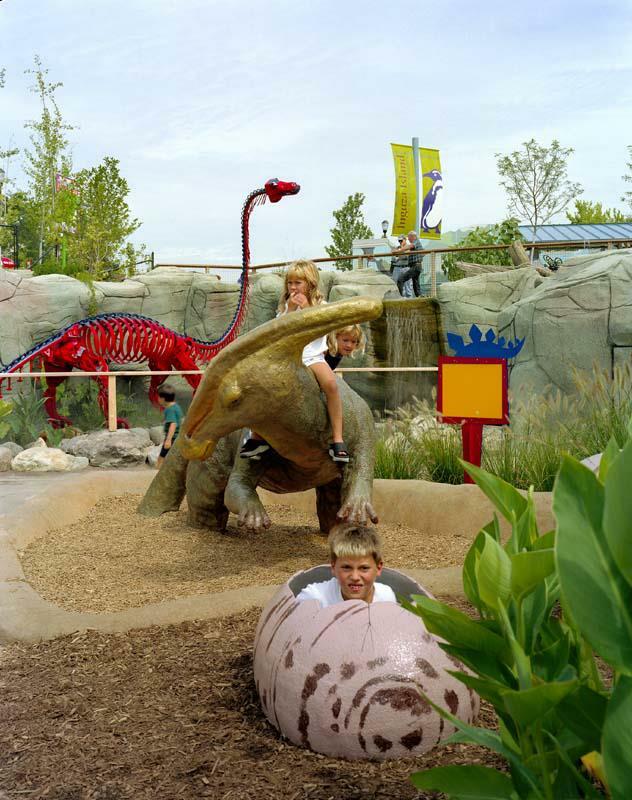 I am trying to think of a place for something like this that could be seasonable in our yard. One more item for the to do list! P.S. Here are the photos from last year’s visit.